Is it a worthy alternative to regular family hatchbacks? · What does a tech journalist/classic car enthusiast think? 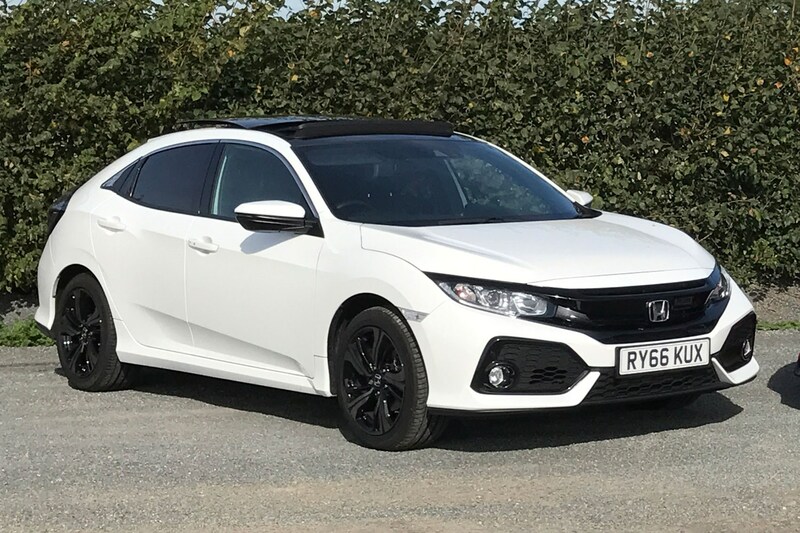 After six months and over 6,000 miles behind the wheel of our Honda Civic, it’s time to say goodbye and see whether it’s a family hatchback that’s worthy of a place on your shortlist. It’s made a good case for itself with distinctive styling, a spacious and well-equipped interior, and an engaging driving experience. But is it something that works on a day-to-day basis? What are the niggles that you won’t pick up on during a quick test drive? What have been the highlights of running the Civic? As part of life in the Parkers office, there’s always something new and exciting in the car park to test drive and get to know. But what I’ve noticed is that jumping back into the Civic after driving several other cars, big or small, is a very relaxing thing to do. It’s been like an old friend you can rely on. Granted, most people will get used to their cars that they drive every day anyway, but once you’ve got everything set up in the Civic, it’s an incredibly easy car to just get in and drive, and there’s a lot to be said for that. And when you do switch the engine on, you can count on an involving drive home thanks to excellent handling, responsive steering and very good body control. Couple that with an excellent ride that deals with even the worst lumps and bumps in the road effectively and it makes for an excellent all-rounder. I’ve also been very impressed with the equipment on offer. At over £24,000, our EX model isn’t cheap, but optioning-up an equivalent Volkswagen Golf would cost a significant amount more – you get it all as standard in the Civic. That includes the various driver assistance systems that we’ve been raving about for weeks. It’s all user-friendly tech as well. Yes, the touchscreen doesn’t look the most up-to-date in terms of graphics, but it’s very easy to use. 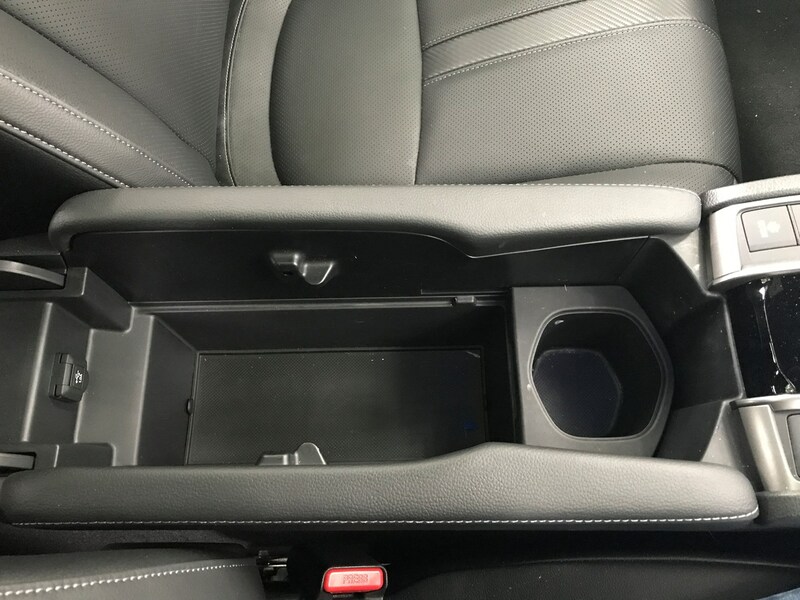 And that’s what I like about the Civic – there’s all the modern convenience you could want, but it’s not intimidating or confusing. Another aspect that impressed me is the practicality on offer. 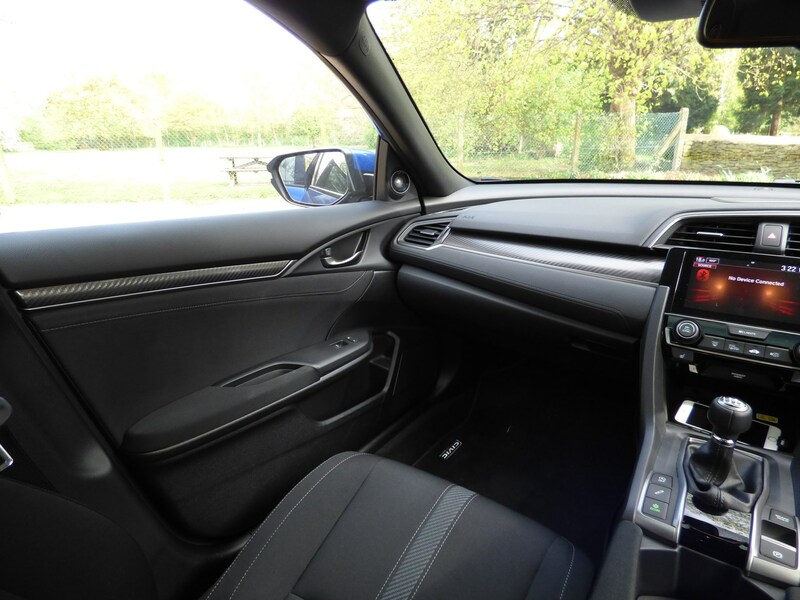 There’s easily room for four adults in the car (although it’s very low down to get into), with plenty of head- and legroom front and rear, and one of the biggest boots in its class. 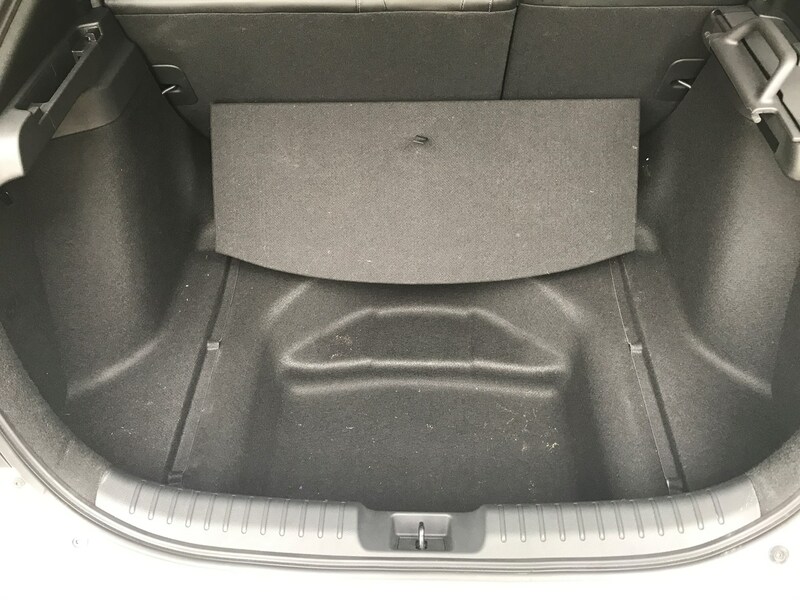 It’s easy to access thanks to a low loading lip, wide bootlid and a clever load cover that slides from side to side and takes up much less room than a regular parcel shelf or sliding cover. 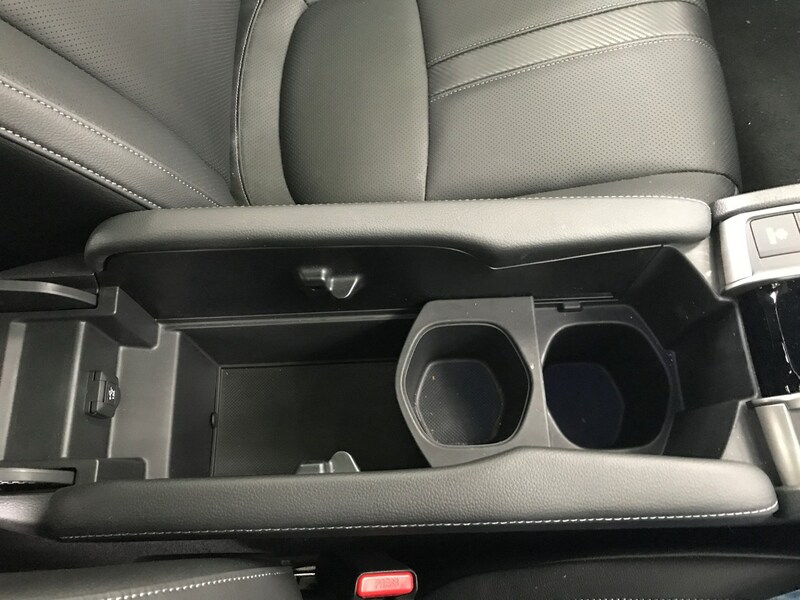 It feels a well thought out car, with volumous storage cubbies dotted about the cabin. What’s not been so good..? So far it all seems rosy, but our time with the Civic hasn’t been without a couple of frustrations – and they’re issues that have caused much debate in the Parkers office. First up is the styling. 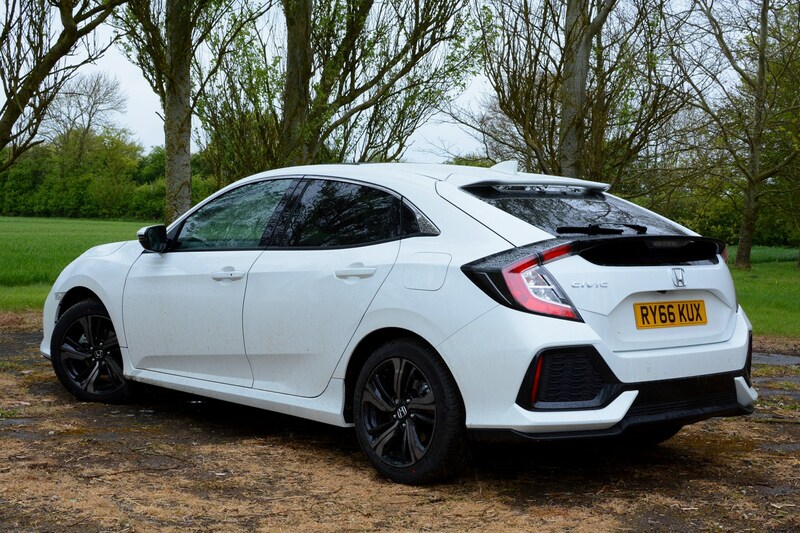 I think the Civic looks really good – it stands out among a raft of dull rivals and gets plenty of attention on the road, even though it’s a mid-range model. I’ve even had previous-generation Civic Type R owners taking second-glances and slowing down to look on the motorway. Not everyone’s convinced, though – with others proclaiming it looks awkward and fussy, and that rear spoiler bisecting the rear window continues to frustrate some. I never found it an issue. In fact, it blocked dazzling lights of cars behind at night, which was quite nice, actually! The main point of contention, though, is that engine and transmission we’ve talked extensively about. Driving the Civic regularly, I became used to its growly engine note and CVT, but it doesn’t necessarily show the Civic in its best light, I’ll concede. To make any kind of progress you’ll have the sound of the 1.0-litre three-cylinder engine roaring through the cabin. And while it’s quite a meaty growl for a sensible family car, the way it makes itself heard can become tiring if all you’re doing is pulling out onto a roundabout or keeping up with motorway traffic. A little more refinement would be welcome. And because you have to flex your right foot fairly regularly to keep up, it’s easy to see the fuel economy figure tumble south. Honda claims this version of the Civic will return up to 56.5mpg, but I never saw more than 45mpg on the trip computer. Perhaps I should have been driving more sedately, but to even achieve between 40 and 45mpg you have to be very gentle, and a lot of the time road conditions and other drivers simply won’t allow for this without you almost causing a pile-up behind you. And finally, towards the end of our tenure with the Civic, I noticed it had developed several squeaks and rattles around the cabin. With less than 10,000 miles on the clock, it’s slightly concerning that it had become so creaky – especially around the sunroof which we’d previously had issues with – but this may have been an isolated occurrence. Overall, though, I’ve enjoyed running the Civic. It’s fun to drive, I love how much kit it has and I really like the way it looks (even better in red or blue). As an everyday car, I’d like a bit more refinement and more impressive fuel economy from the dinky 1.0-litre engine, but you can’t argue against the comfy ride and generous interior space. There’s a huge number of alternatives out there though. There’s the evergreen appeal of the accomplished-all-round VW Golf, and the excellent-value Skoda Octavia. Neither of these cars are as interesting as the Civic, though, but then if you want sharp looks you can look to the SEAT Leon or Mazda 3 as well. 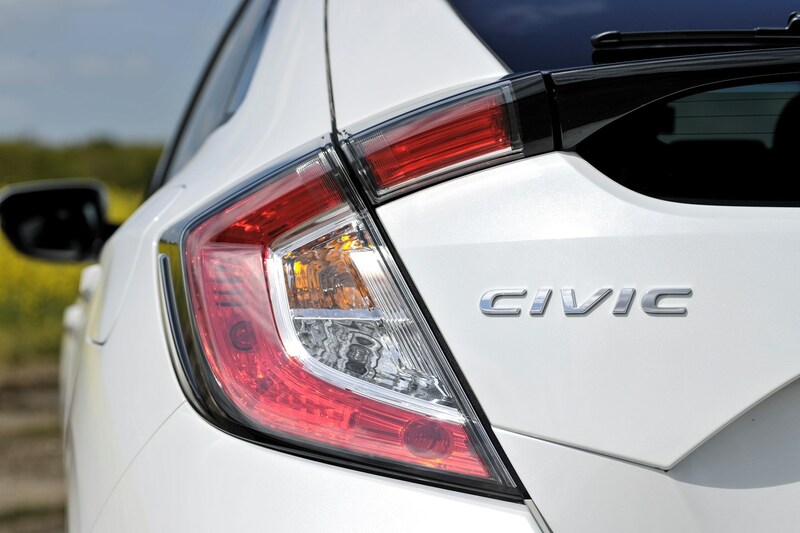 If technology and space are high on your list of priorities, then it’s well worth a look at the Civic. Just make sure you pick an engine and gearbox combination that you know you’ll be able to get along with. If the newspapers are anything to go by, in a few years’ time we’ll all be chauffeured around by self-driving hover cars that’ll do your laundry and make you a cup of tea in the morning. Maybe. But until that happens, car manufacturers are constantly striving to pack their cars with the most advanced and futuristic tech to make life on the road that little bit easier. 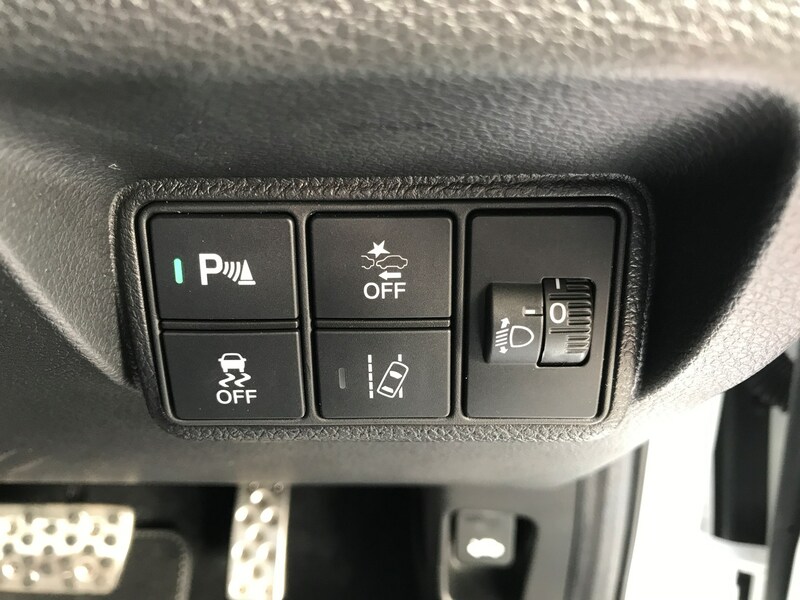 I’m all for modern technology and making life easier for me, but will most people use the kind of kit that we’re starting to find on our cars? Is it all as intimidating to use as it seems? It’s not if you’re piloting the space-age Civic which isn’t at all intimidating to drive. That doesn’t mean it’s a simple car. 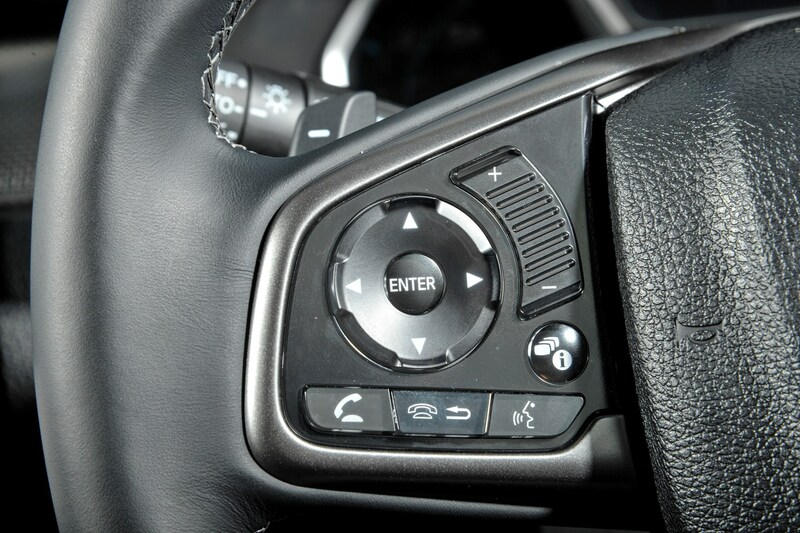 In fact, it’s packed with driver assistance and safety technology to keep you in control on the road. If that sounds like a lot, it is. You’d have to spend a lot of extra money for this kit on some of the Civic’s rivals, so it’s impressive that so much is included in our mid-range model. The best part is that it's integrated into the way you use the car really well. You’d expect any car tech to do that anyway, but the way in which you operate the systems isn’t confusing like it can be in some. The blindspot monitor illumintaes in the door mirror as it should, and if you want the lane departure warning on there’s a button on the steering wheel, but this system does get quite presumptuous that you’re always going to drift out of your lane. If you get close to the line without indicating it immediately nudges you back into the lane. The adaptive cruise control is a particularly easy system to use. I think I’m one of the few people who NEVER uses adaptive cruise control, though. In any car. I don’t like it most of the time because you have to indicate and move out to overtake so far in advance so the car doesn’t think you’re going to slam in the back of the car in front. I've no issue with forward planning, but if somebody is barrelling down the lane you're moving into, causing them to slow down seems counter-productive. However, slamming into the car in front is an unlikely event in the Civic. 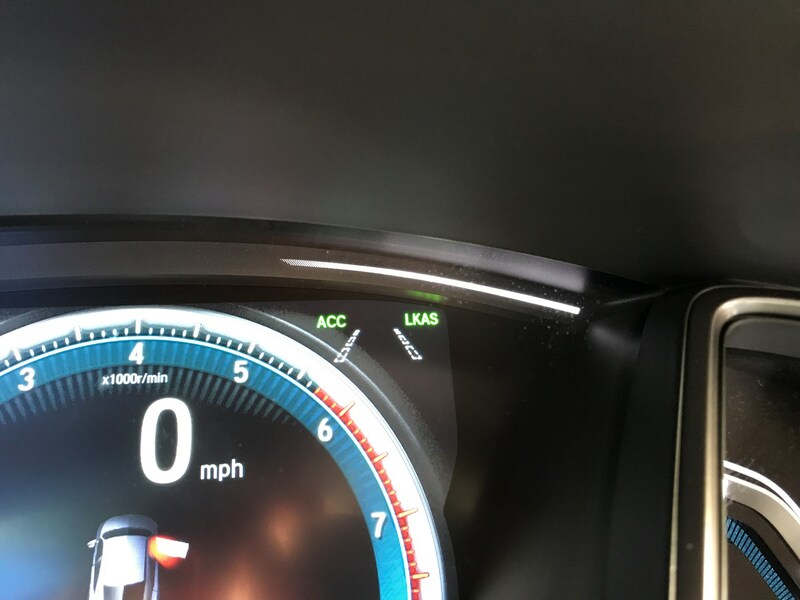 Its collision-mitigation system thinks you’re going to crash into most things, flashing and beeping on the digital dash display when you’re not even that close to something. I’m happy with all of the other tech, but not this system. It feels too nervous of cars in front and will just remind you that it’ll brake for you by dabbing on the brakes if you do get too near. It came into its own recently when somebody travelling in the outside lane of a dual carriageway decided they needed to be in the inside lane (in front of me) as we approached a roundabout. They swooped in and before I could brake, the car was beeping and had already started to brake for me. And when I had to apply even more pressure to the brake pedal, the hazards flashed to warn cars behind. So while I don't normally like it at cruising speeds, the safety tech works when you really need it. And I can't argue with that. Whether you need it or not, it’s there on most Civic models, but you don’t have to use all of them. I don’t use the lane-keep assist, nor do I regularly use the adaptive cruise control, especially if you’re changing lanes regularly. I don’t think it – and many other systems – are quite smooth enough to make constant and steady progress without pulling out into another lane far too far in advance. However, it’s so easy to use all of the systems in the Civic that it’s encouraged me to have a little more faith in them. Top marks to Honda. We’ve become accustomed to our Civic’s quirky looks that tend to split the Parkers office in two. The same can be said of what’s under the bonnet, but sometimes it’s refreshing to hear an outside opinion on something. I name my cars after spaceships so the sci-fi appearance of the Honda is immediately appealing, even if there’s a conventional internal combustion engine rather than a hybrid or far-fetched power source under the bonnet. The interior is very appealing, with style backed up by real utility in the number of storage compartments, interfaces and power points. 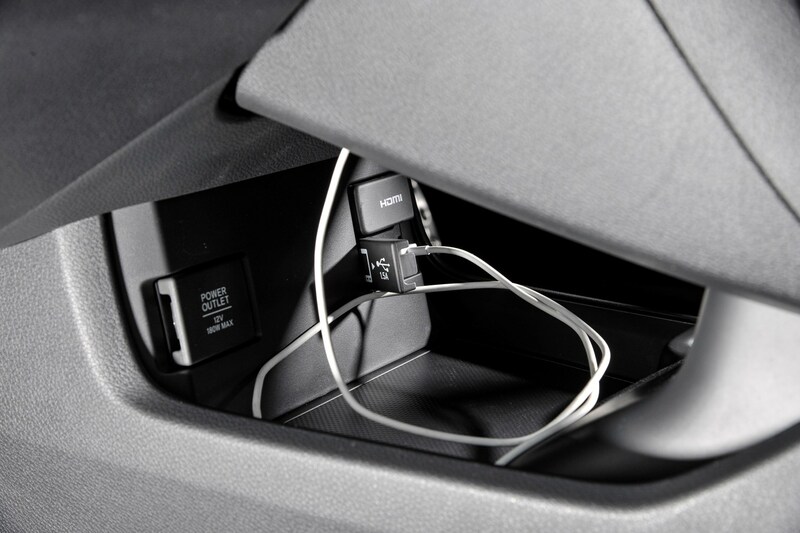 As mentioned by Tom, the smartphone storage – connected, then out of sight – is delightful and minimises potential driver distractions. Up front and centre, the digital dashboard is beautifully implemented with smooth transitions between modes and excellent legibility. A subtle green band that fades to white as your driving style becomes less economical is soothing, rather than hectoring. Poor rearward visibility is compensated with blindspot monitoring, rear and surround view cameras, and reassuringly large mirrors, while the forward view is dominated by the swooping humps of the wheelarches. This is no lumbering leviathan; it’s more of a lone-rebel’s craft. This is the first car I’ve had the opportunity to try Apple’s CarPlay integration with, which reflects the slow pace of adoption in the wider marketplace. 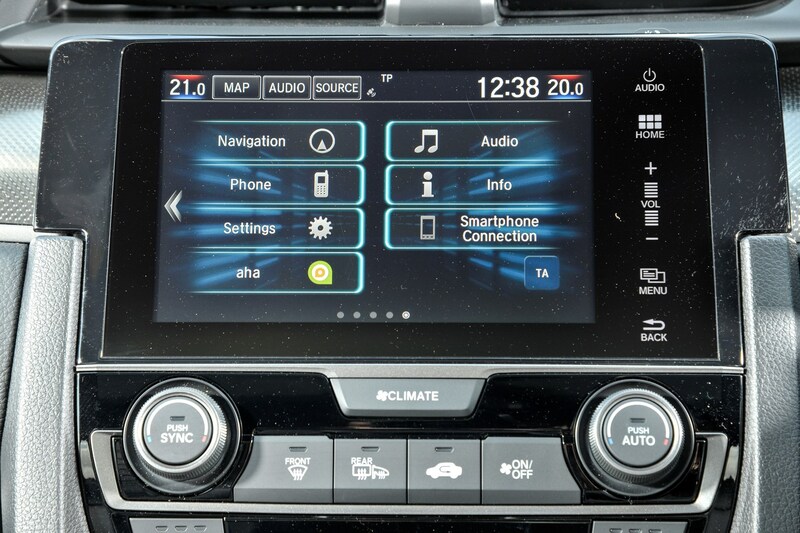 Honda’s infotainment system is one of the better setups, with responsive touchscreen and relatively natural voice control, and as such the urge to get the familiar iPhone interface is less pressing. Nevertheless, the plug-and-play transition from Honda to Apple user interfaces is consistent, and the largest surprise is the sparse range of features. 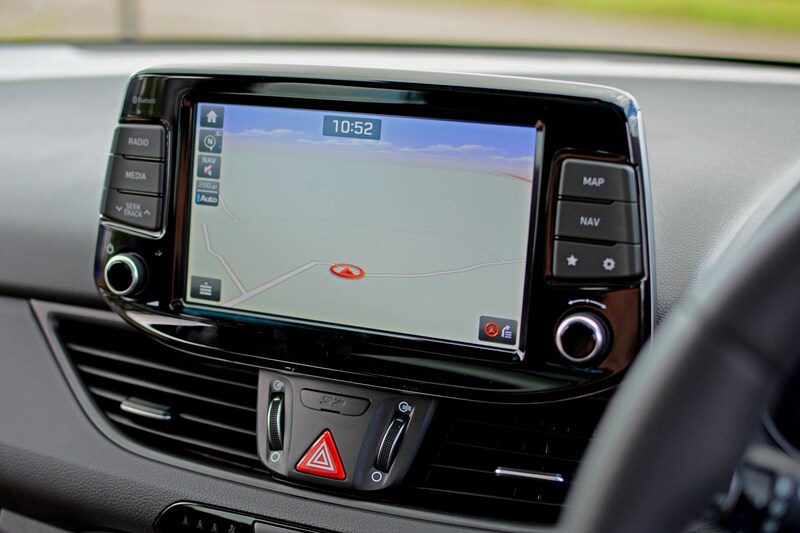 At least on first connection, the lack of third-party navigation tools like Waze is a surprise, and Siri’s reticence when in a poor signal area becomes frustrating, when the Honda voice control works in all conditions. 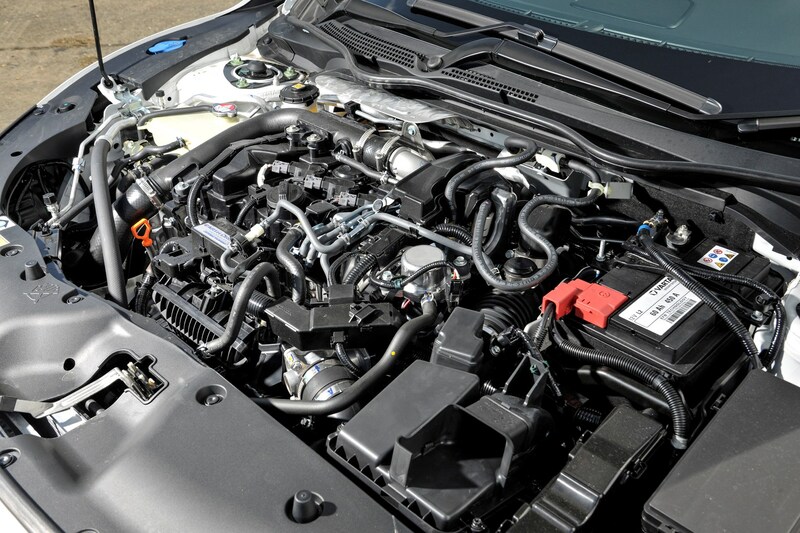 If you’re going to build a small engine with a narrow power band, pairing it to a sophisticated CVT transmission is the way forward, and your preconceptions about engine capacity will soon be forgotten. It’s noisy when worked hard, and it is not an entirely pleasant sound, at odds with the futuristic aesthetic. The economy benefits in the real world seem questionable, too, with the on-board computer suggesting 38mpg average. In congested situations, the mpg and emissions advantages are more significant. Performance from standstill is relatively lethargic, though only by comparison with traditionally engineered cars. It’s more than adequate for real-world progress. Motorway cruising and commuting on fast A-roads is where the Civic excels, a combination of sharp steering and effective semi-autonomous features providing a perfect balance between driver engagement and stress-free progress. 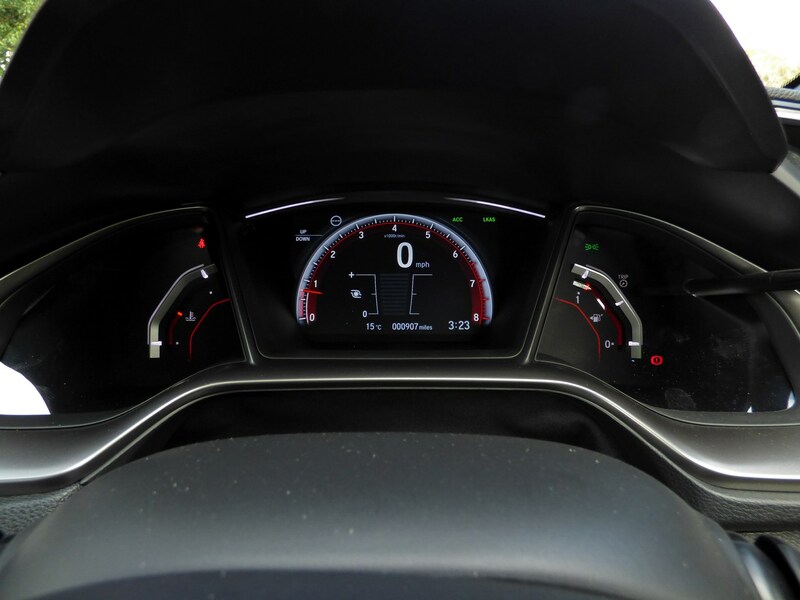 Where some lane-keeping systems are very reactive, Honda’s extends that telepathic steering feel, keeping the weight of the steering intact as it imperceptibly takes responsibility for the dual-carriageway drudgery. Likewise, the adaptive cruise and braking are a natural complement to the CVT. Leave the dual carriageway, escape the traffic, and excellent forward sightlines meet communicative chassis and steering. Forget about the Sport mode on the transmission – the paddles and seven simulated ratios may feel like they’ve given you control, but as with the commute, the Civic can do it better than you. Just enjoy the remarkably rapid, assured pace the car sets. 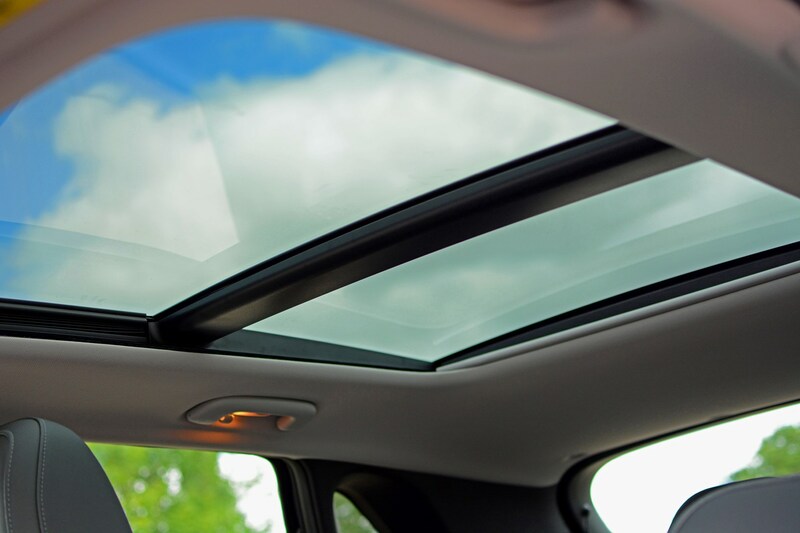 On this model, the large sunroof can be opened without undue buffeting at speed, too. Pick some familiar music, let the sunshine in and enjoy. In my mind a 1.0-litre turbocharged car conjures up images of a frantic, buzzing and breathless experience. Soundtrack aside, the Civic debunks that thoroughly, and impresses immediately. What's next for the Civic? The car world is full of technology one-upmanship, especially when it comes to fancy media systems and connectivity. Honda’s fitted its 7.0-inch touchscreen infotainment system to the Civic, sitting in the middle of the dash. Nothing new here. In truth, not much, but that’s exactly what I like about it. It’s not fussy and it’s not complicated, and I’m all for something that makes my life a bit easier on the move. It’s a bit annoying that you have to press ‘OK’ on a safety warning every time you switch the car on, but if you ignore it and don’t plan on using the screen, you get a rather nice star-lit sky with a clock as your screensaver. And that’s actually preferable, especially at night. 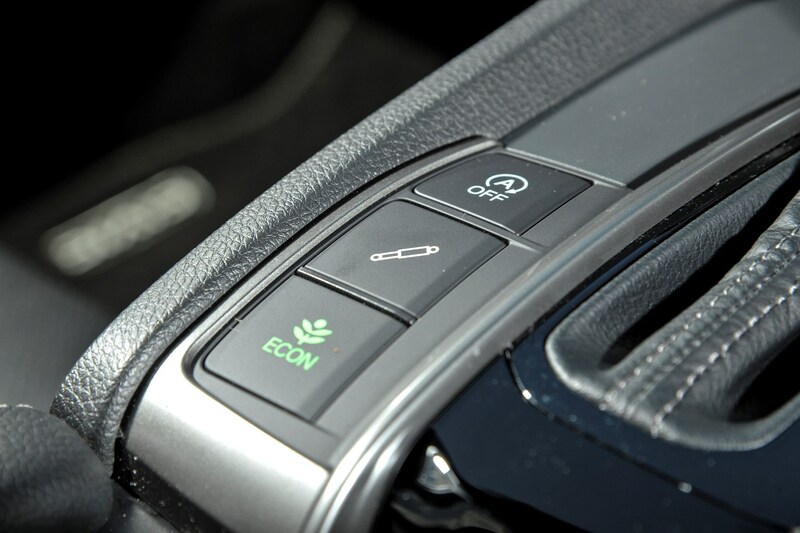 Once it’s on, there’s a simple menu set-up with clear ‘buttons’ for all the different functions. Honda hasn’t overcomplicated its infotainment and it’s all the better for it. Granted, it doesn’t look the most sophisticated, but there’s more to life than that sometimes. All I want to know is that I can jump in the car and just use it. Selecting a radio station (DAB is standard) does seem a bit of a faff in comparison, with fiddly parts of the screen you need to select. The solution is to take ten minutes when you first use the car to save your favourites, and you’ll never have to worry again. And if you don’t listen to the radio, the Civic comes with Apple CarPlay and Android Auto as standard, so all you need to do is plug your phone in and job done. That’s even easier than using the radio (once you’ve found the correct USB port to use… It’s NOT the one in the armrest). I haven’t had much use for the sat-nav (thank you Geography degree), but when I do use it, it’s a very easy system to use, despite its dated graphics. It’s a Garmin-based system so you know you can rely on it, and it’s possibly one of the easiest and most reliable systems out there for putting in an address, whether or not you have the full thing or not. I have no complaints in this sense, and I like that you can still use Apple CarPlay at the same time – it doesn’t default to using Apple Maps like some other cars do. I also like that there’s a little switch at the top of the screen to quickly alter the brightness, switch between day and night modes or just switch the screen off altogether to reduce glare at night. Why more cars don’t have this kind of thing is beyond me – it’s so much better than having the settings buried deep within a menu off a sub-menu. It’s only when you come to switch functions or change the volume when the frustrations start. 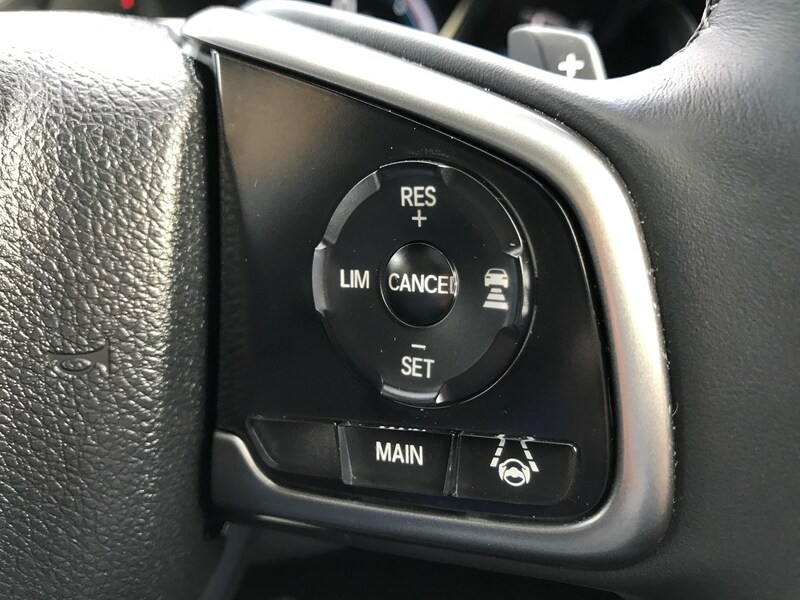 Honda has made the decision to replace things like a volume knob, instead adopting touch-sensitive ‘buttons’ at the side of the screen. I simply can’t get used to it, there’s nothing easier than using a knob to change the volume and a physical 'Home' button. The alternative is to use the buttons on the steering wheel which is much better, but they’re the buttons I’ve previously complained about feeling a bit cheap. Still, it’s much easier and safer to do than vaguely prod somewhere near the screen. All in all though, I have very few complaints about the Civic’s media system, in fact it's one of my favourite things about it. It’s easy to set-up, there’s plenty of functions to make use of easily and I like that there’s a choice of connectivity options. Competition for the Civic is very strong, and very plentiful indeed. So much so, we definitely don’t have enough time to get all possible rivals together in one place for a hatchback mega test. We’ve already seen how it stacks up against the evergreen VW Golf, but what about some equally sensible competition in the form of the Hyundai i30? 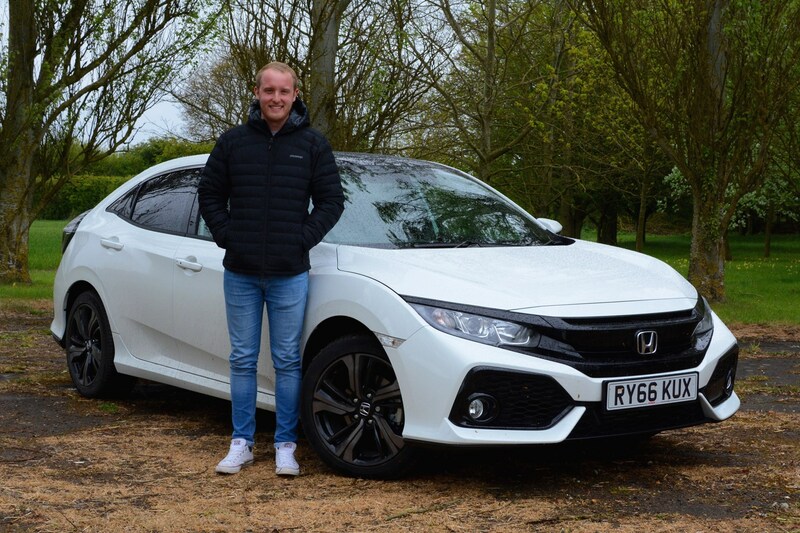 We’ve gone into great detail about what our Civic is like to drive, and very good it is too when it comes to handling, but the engine and transmission have held back some of the excitement. 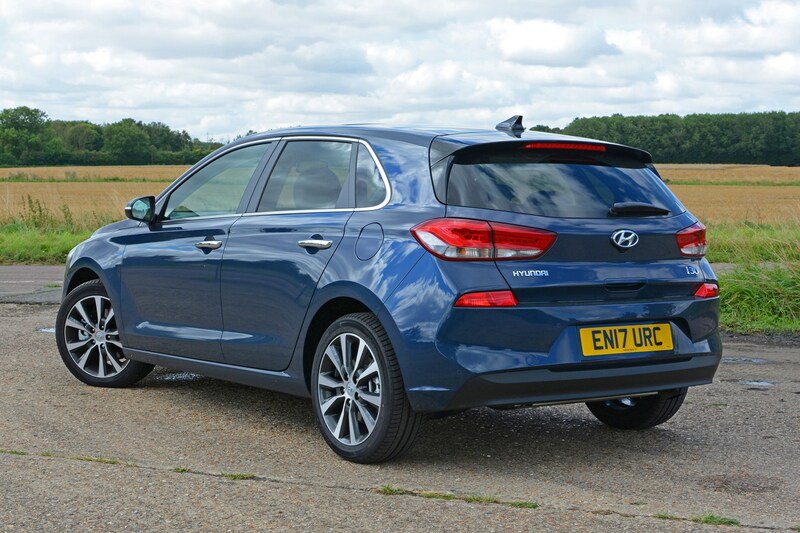 There’s less to debate about with the Hyundai i30’s 1.4-litre T-GDI turbocharged petrol unit though. It’s very hushed compared with the Civic (it’s a four-cylinder), and offers 11hp more power and 62Nm more torque. You really notice that straight away. 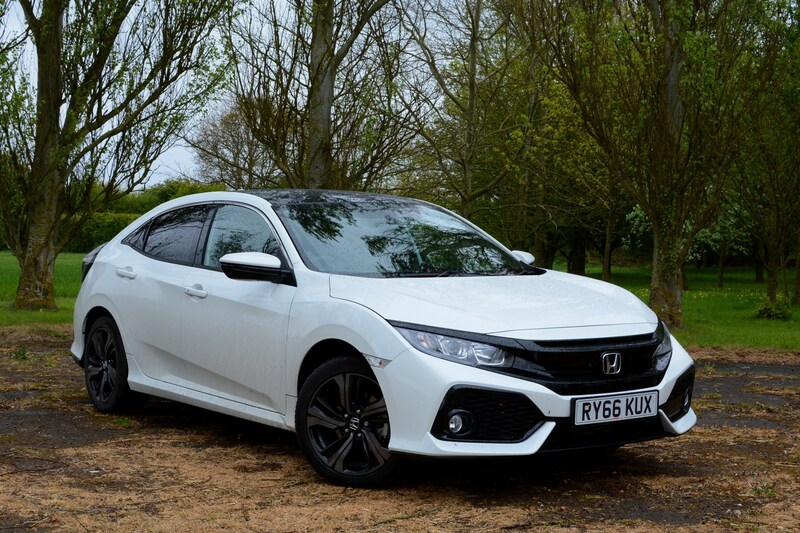 Not only is it smoother and more refined, it also feels much perkier and eager to get going than our Civic, which contributes to a greater sense of urgency all-round. If you try to be speedy in the Civic, you’ll know about it by the noise. You could be left wanting for a bit more get-up-and-go if caught out in the wrong gear, so you'll need to make use of the six-speed manual to get the most out of it, though it’s a slick gearbox with a nice shift action. How do they compare inside? Jumping into the i30, you realise just how low-slung the Civic really is. The Honda feels lower and more laid back, whereas the driving position in the i30 is traditional hatchback, but it’s a nice place to spend time. 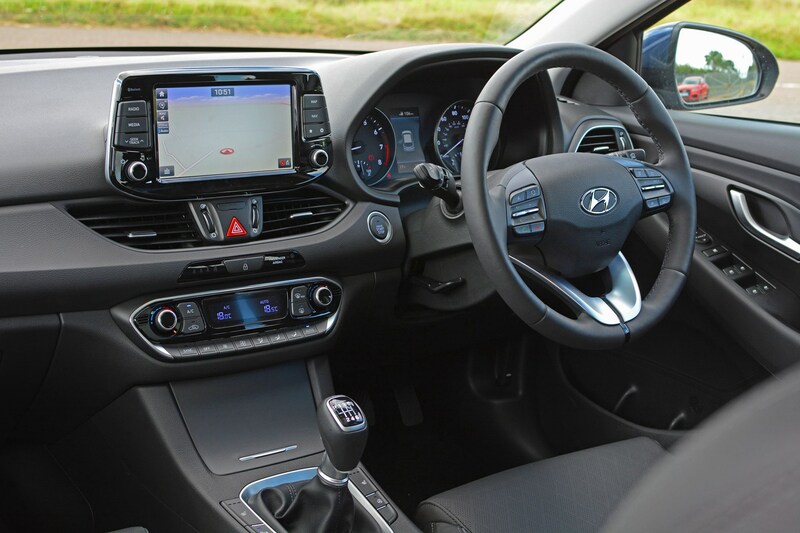 It’s also quite a bit easier to familiarise yourself in the Hyundai, with a big touchscreen infotainment system that’s an absolute breeze to use. The Civic’s isn’t difficult to operate, but the i30’s is just so simple and looks more up to date. Quality is better in the Hyundai as well, and this Premium SE (the top-spec model) comes jam-packed with equipment like our Civic does, but at a lower cost. At the time of writing, the Hyundai costs £23,655, while our Civic costs £24,600. A lot, but that’s the case for both cars. 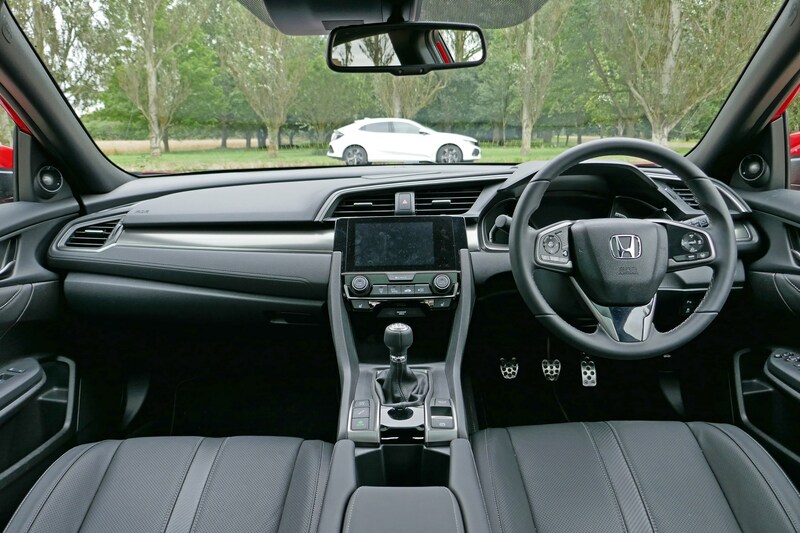 While the Civic can get very expensive towards the top of the range, mid-spec EX is very well specified for the money, with full leather, a touchscreen media system packed with features and a healthy dose of driver assistance and safety tech. 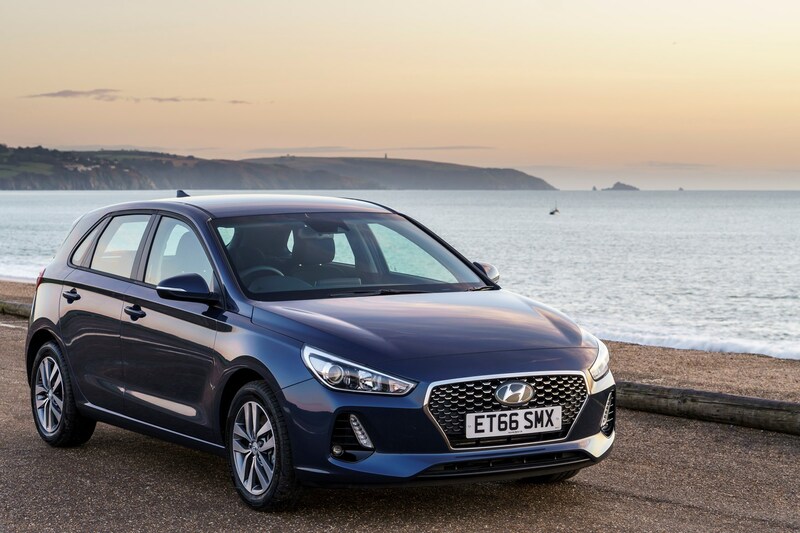 The i30 is equally generous, with a big 8-inch touchscreen with Apple CarPlay and Android Auto, sat-nav and DAB radio, while the leather seats are heated (along with the steering wheel), the panoramic sunroof is huge and there are sensors all-round as well as a rear-view camera. The i30 pulls ahead with electric seats and a full set of LED headlamps, which are particularly bright and impressive, and wireless charging. You can specify the latter two of these on the Civic if you go for the Tech Pack at extra cost, though. These two come very close in terms of spec, being particularly generously equipped as standard. They’re also more comprehensively specced than a lot of their rivals, which boosts the appeal even further. The i30 impresses with how much you get for slightly less money than the Civic, though, and the more refined, more powerful engine means it’s more pleasant to use every day. 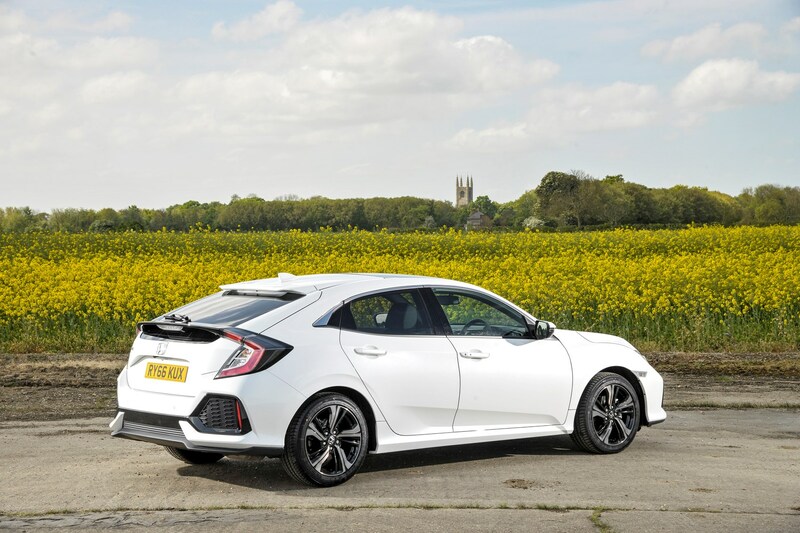 It’s not as fun to drive on a country lane as a Civic, though, and while it offers a spacious and bright cabin, it can’t compete with the Civic for practicality. It’s also not as interesting as the Honda. The wacky looks of the Civic divide opinion and won’t be for everyone, but the i30 does look quite anonymous in comparison. While for some, that’s exactly what they’ll be after (it’s worked for the VW Golf), but there’s a part of me that likes how brave Honda has been. 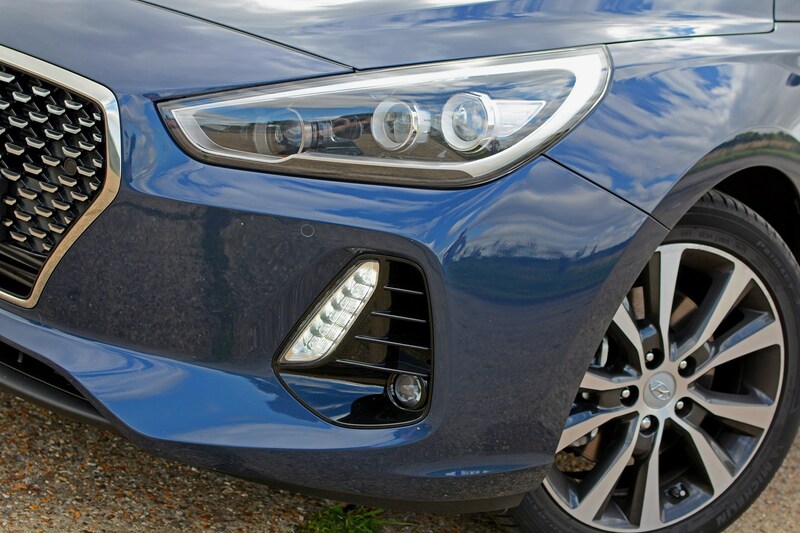 For me, I’d probably pick the Hyundai to use everyday, though, as the functions you use most often in the car are much more user-friendly, and it’s a more relaxed and refined experience, too. Don’t discount the Honda, though, as it offers an awful lot of car compared with the competition. Eighth report: CVT or manual? 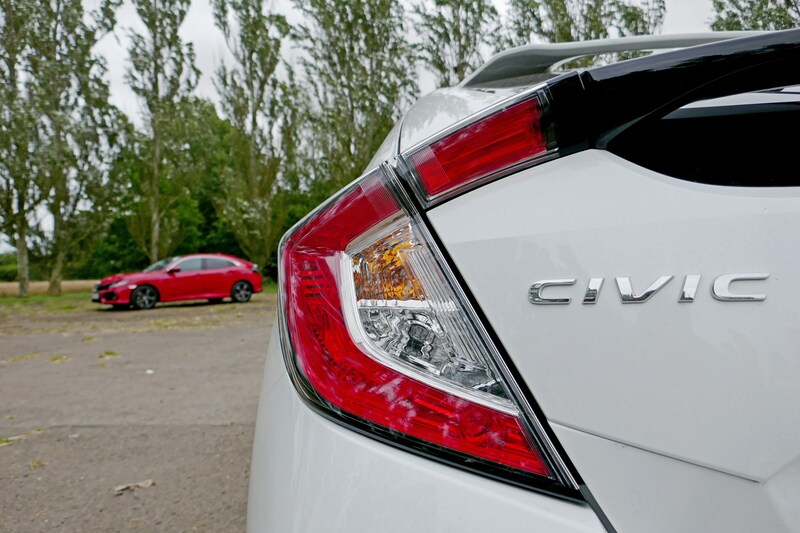 Honda has kept things simple with its engine and gearbox options for the Civic. 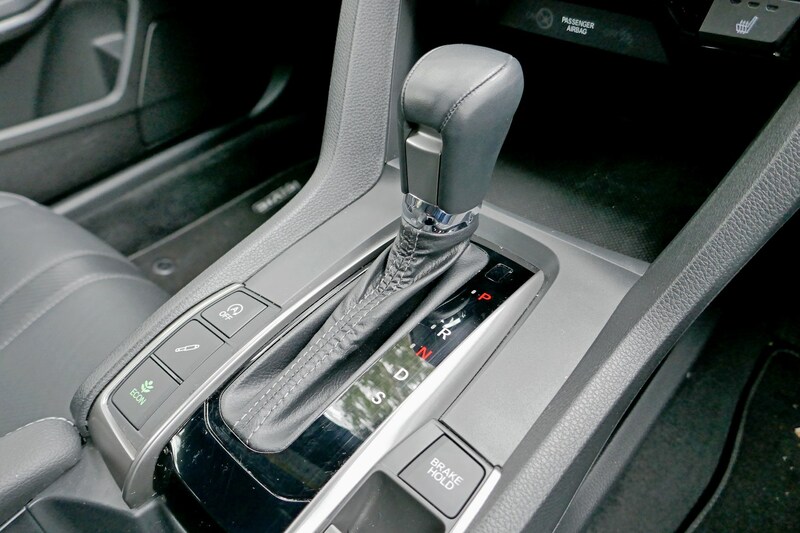 If you want a 1.0-litre turbo like our car, you can choose between a six-speed manual or CVT automatic transmission. Or if you want the 1.5-litre turbo, you get the same options. Easy. 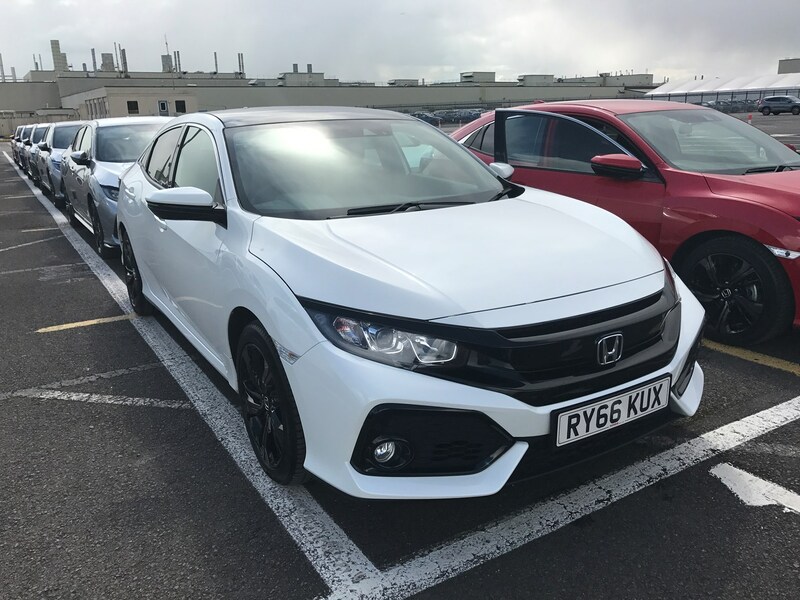 Having settled into life with our CVT Civic, it’s about time we jumped into its manual equivalent, to see if we’re missing out. CVT transmissions often get a bit of a bad rap. They can send the revs soaring if you put your right foot down to make any kind of progress, and to some degree, our Civic is the same. However, Honda has engineered simulated gear changes to make it feel a bit more like a regular automatic gearbox, which helps normalise things. But it still has its moments and, in combination with a noisy three-cylinder engine, it’s still quite intrusive when you want to move a bit quicker. If you want to just cruise around, it’s a fairly calm experience. The power delivery is smooth if you’re gentle with the throttle, and it’s very easy to drive. It’s a combination that, on the whole, works quite well. I’m finding I’m driving in S rather D, though, just to make things feel a little more urgent as it can get caught out by running at low revs at times. Driving like this doesn’t always seem to make much sense, though. This car isn’t about performance, so I should just be pootling about. But sometimes you need a bit more get-up-and-go, so driving it around in a more sporting mode means it’s all a bit louder, a bit more abrupt and not as smooth as it should be. Is the manual Civic the solution? 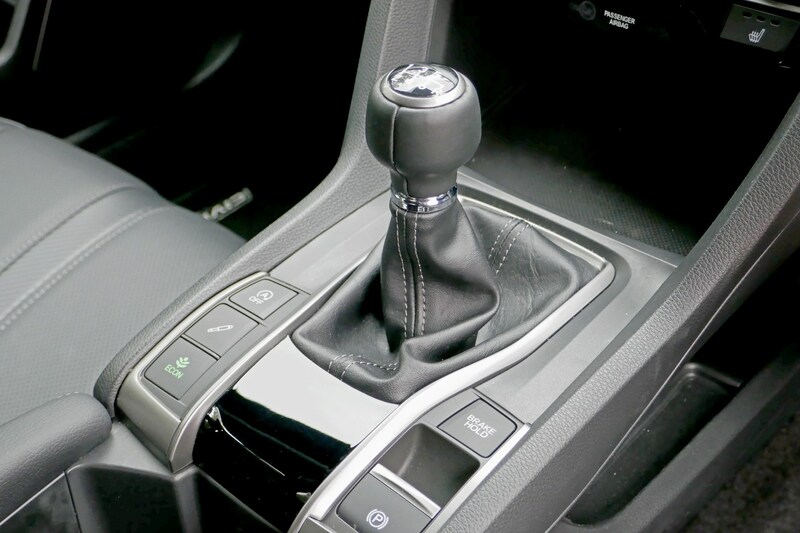 The problem for the CVT is that Honda has a reputation for making excellent manual gearboxes. It’s not as involving to use as you might think, though. What I noticed early on is that the throw is quite long and the shift action itself isn’t as slick as I’d hoped. The gear lever is well-placed though, so it is the more enjoyable to use of the two, but I was expecting more excitement from the manual and it was a much jerkier experience than I’d originally expected (but maybe that’s just bad driving on my part). It does get the best out of the Civic’s excellent chassis though, I can’t deny it that fact. It’s also much more relaxed at speed, revving much lower and, as a result, it’s much quieter in the cabin. 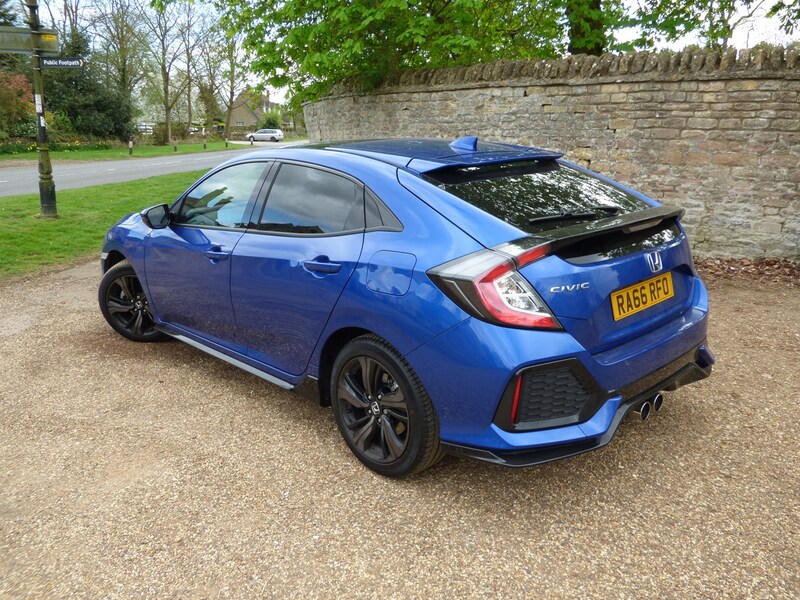 With this in mind, it seems strange that the more relaxed of the two is the car with a manual gearbox, however it’s easier to make the most of the performance on offer by going for the manual Civic. Parkers Junior Staff Writer James Dennison had a slightly less glowing review of our CVT: ‘It’s painfully low on urgency. It just doesn’t go when you put your foot quarter, half or even three quarters of the way down. You have to really give it the berries if you want to make a decisive move. ‘Move past this issue and the ‘changes’ are impressively smooth, plus you gain lots of speed in the same ratio without having to worry about the loss of momentum from a shift up. If I’m being completely honest, I was ever so slightly disappointed by the manual Civic. I’d built up a vision in my head that it was going to be more involving and fun to drive than it was. While it's more flexible and responsive than our car, the gearbox didn’t feel quite as tight and slick to use as I was expecting and, as a result, I was left feeling content to get back in the CVT. I’m aware that the CVT transmission isn't as slick as a SEAT Leon's DSG offering, but the Civic’s isn’t bad, and the way it moves up through the stepped simulated gear changes makes it feel a bit more normal. And while the manual car was more involving on a country road, more relaxed on the motorway and took greater advantage of the Civic’s excellent, balanced chassis, it did take some getting used to after driving around lazily in the CVT, which is a smoother (if noisier and thirstier) way of getting about in a Civic. Three months behind the wheel of the Honda Civic is showing us it’s not quite as economical as the official figures promised. It’s not uncommon for a car to be some way off the claimed figures from the manufacturer – that’s not news – but what’s continuing to concern me is just how far off the official figure I am. According to the specs, our 1.0-litre turbocharged petrol should be returning up to 56.5mpg on the combined cycle, yet I’m struggling to get more than 40mpg in everyday driving, and I’m visiting the petrol pump every 350 miles or so, which doesn’t seem to add up for a sensible family car. I acknowledge that it’s unlikely I’d get really close to the claimed figure, but the trip computer won’t seem to shift from 38mpg, and when I calculate how much I’m averaging on a tank, the number always starts with a three. You do need to work the engine and gearbox quite hard to make quicker progress, but even when you’re not in a hurry, putting your foot down slightly can send the revs whaling which can’t be any good for economy. I think it’s time for an economy run to see if I can get closer to that magic 56.5mpg figure, but I sense I’m going to need some patience in doing so. Honda is good at making practical, sensible cars. That much is a fact. The Jazz is a beloved practical supermini and the HR-V is one of the most versatile compact crossovers on sale. The Civic is just as useable, thanks to that longer body and clever packaging. And, despite the lack of Magic Seats – Civics of old feature cinema-style seats that flip up to allow the transport of larger items – ours is proving very versatile indeed. It’s vast. At 472 litres, it’s by far one of the biggest in its class, with only the Skoda Octavia eclipsing its capacity at 590 litres. However, there are some clever touches to boost practicality. 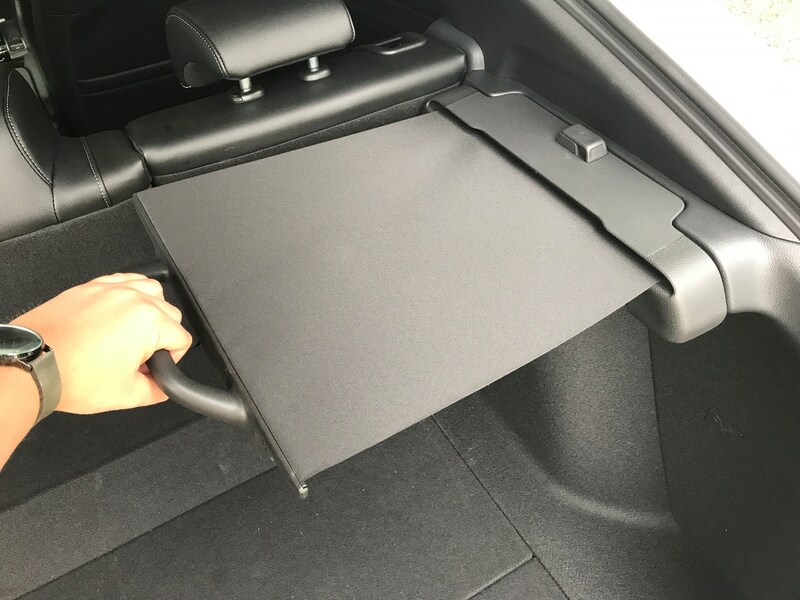 There’s an integrated cover that stays stuck to the inside of the tailgate, as well as a sliding cover that goes from side to side rather than back to front. It can be detached as well, should you want it out of the way to carry larger items. The best part is because it goes from side to side, it’s a significant amount smaller – meaning easier to store – than your average luggage cover. 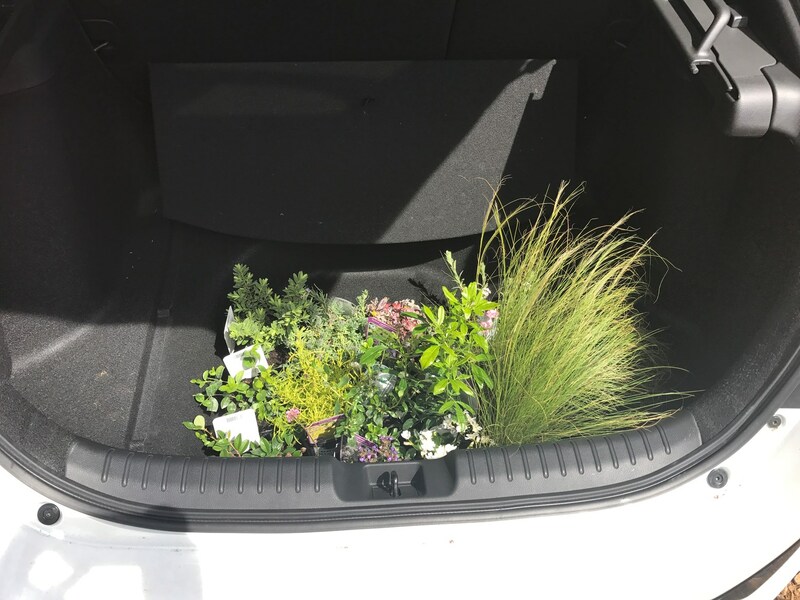 And there’s plenty of space to stow it too, with a vast under-floor storage area where a spare wheel would ordinarily live, which I’ve discovered is ideal for transporting small potted plants for my ongoing garden project at home. Like I said, who needs Magic Seats to transport plants when you have neat alternatives like this? Move forward through the car and practicality continues to shine. The Civic is longer than closest rivals like the VW Golf and Vauxhall Astra, meaning passenger space is very generous. A trip out with family brought plenty of positive comments about the amount of legroom in the rear, even behind a taller front passenger, although the sunroof was a welcome addition to brighten things up due to the dark headlining. One black mark was ease of access though – the Civic is noticeably lower than other regular family hatchbacks. While this is no issue for me, those who value a more accessible car – such as parents of young children or those of an older generation – could well be put off. In the front, there’s little to complain about. I’m enjoying the low-slung driving position and there’s plenty of adjustment in the seat for most. What I am beginning to notice, though, is that the driver’s seat feels slightly as though it’s tipping me forwards, and my foot gradually slips off the accelerator pedal much easier than in any other car. Maybe I need better shoes. I’m going to make myself sound incredibly dull here, but I must admit I’m loving the amount of extra storage bits and bobs dotted around the Civic’s cabin. And most of this love is for the enormous space found between the two front seats. At first I wondered what I’d actually put in there because it’s so vast, but that was just silly. Everything just gets chucked in there now. 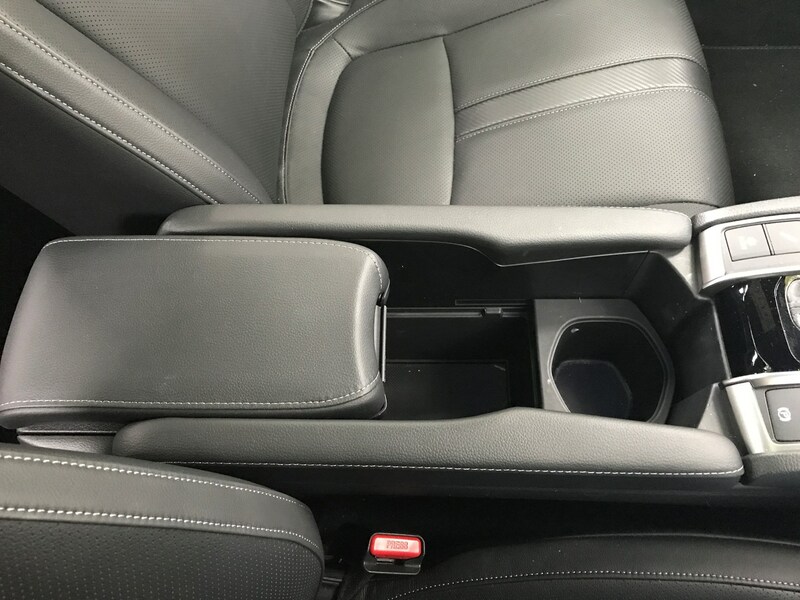 You can choose between one or two cupholders, and the armrest section slides back and forth as well to boost comfort. That’s not all though. 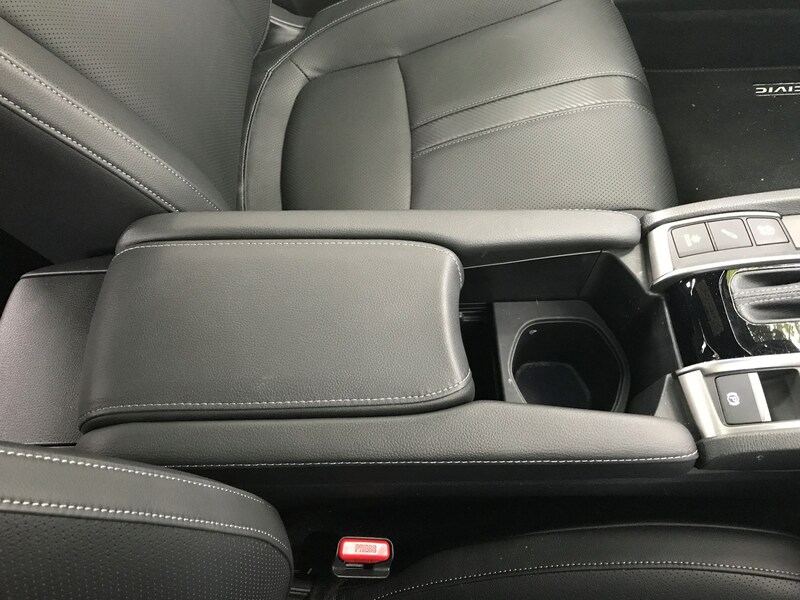 While it confused me at first that you HAVE to use a particular USB port for connections via Apple CarPlay (it’s located in a secret-ish bit behind the centre console) rather than the one in the armrest, it does mean wires are kept under control as there’s a small gap to feed it through. That means your phone can sit tidily out of the way just ahead of the gearlever. Until the new Honda Civic Type R arrives on UK shores, the most powerful version of the Civic you can get your hands on is the 1.5-litre turbocharged petrol. Pushing out 182hp and 240Nm of torque, it sounds an awful lot more tempting in terms of performance when compared with the dinky 1.0-litre turbo in our car. With an 8.3-second 0-62mph time, the 1.5 promises to be much livelier, at least on paper. By comparison, the 1.0-litre CVT completes the sprint in a more leisurely 11.0 seconds. Do these figures matter in the real world? To most people, probably not. I took the 1.5-litre Civic on the same route home I normally take in the 129hp 1.0-litre, and while the larger unit had a bit more useable power for overtaking (the 1.5 has 60Nm more torque than the 1.0), in most situations it didn’t leave me feeling like I’d be missing out when I got back into ‘my’ Civic. It’s better suited to motorway stints in this sense, enabling drivers to overtake slower moving traffic much more easily thanks to its smooth and responsive power delivery, but careful planning in the 1.0-litre using the paddles means it is more than capable of keeping up. What I did miss was our three-cylinder’s thrummy engine. The growl from under the bonnet of the 1.0-litre turbo is very characterful, although sometimes I wouldn’t mind if it was a little more hushed when I want a more relaxed journey home. And it’s something passengers have noted, too. I suspect the level of noise comes down, in part, to the nature of the CVT gearbox, though, revving quite high and making itself heard when you put your foot down. While it’s definitely one of the better CVT gearboxes out there with stepped ratios simulating that of a normal automatic gearbox, being able to take control of the gearbox myself would be more enjoyable at times when I’m not just in the mood to cruise home in Drive. This becomes especially apparent when you drive a Civic fitted with a six-speed manual gearbox. It’s blessed with a lovely, mechanical feel with a really positive shift action – there’s real fun to be had in working your way through the gears. With this fitted, our Civic would become a much more involving car to drive. For now, though, I’ll hold back on a definitive verdict in terms of gearbox choice, until I get behind the wheel of a like-for-like model with a 1.0-litre engine and manual gearbox. Initial impressions from the 1.5 manual, though, suggest I may be quite taken by it. You’d think the 1.5-litre turbo in attractive Sport Plus spec would be much more expensive than our 1.0-litre CVT EX, but in reality there’s not an awful lot in it. As tested, our car costs little more than £25,000 (that’s with metallic paint), while a 1.5-litre Sport Plus costs £25,900 with metallic paint in manual form. We’ve already run through how comprehensively-equipped our EX model is, and we’re enjoying all of its gadgets, but Sport Plus is hardly spartan, either. The main thing that’s different are pieces of black exterior trim along the sills and around the lower edges of the bumpers, plus a set of really slick LED headlamp units. They’re quite striking and, in my opinion, more attractive than those offered on the EX. 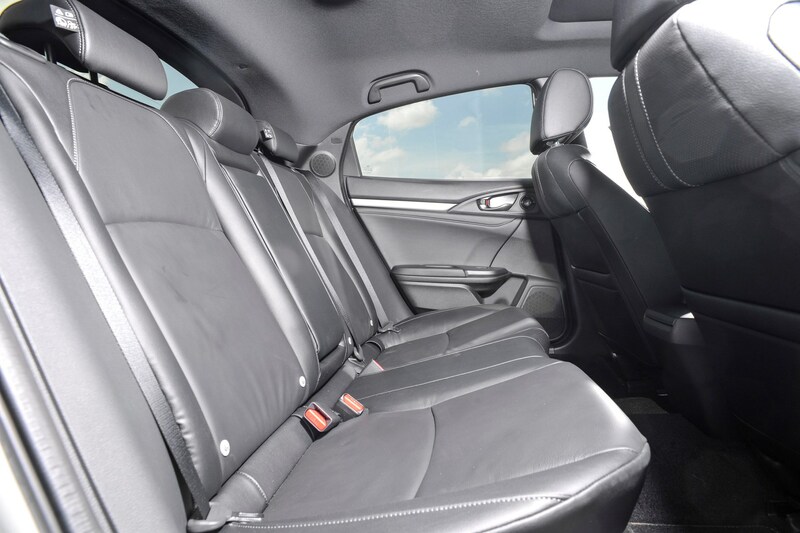 However, the Sport Plus goes without the heated leather seats of our car, instead offering cloth sports seats that are still supportive and comfortable. In reality, these two particular examples are likely to be bought by very different people. Someone looking for the more restrained model (power-wise) with a relaxed auto gearbox is unlikely to be considering the 182hp version with a manual transmission, but it’s an interesting exercise to see how the rest of the Civic range performs. Despite the small difference in price between the two engines, we’d still stick with the 1.0-litre turbo. For most people it’s plenty powerful enough, and the 1.5-litre doesn’t really feel as fast as the figures suggest in everyday driving. The manual gearbox is a sweet thing, so if a CVT gearbox isn’t a must-have, we’d be inclined to save even more money and go for the 1.0-litre turbo in manual form. The Honda Civic and VW Golf have both graced our roads for over 40 years, and they’ve both matured in their own ways. Volkswagen has pursued the sensible route with an evolutionary design, while Honda has gone a bit wild with the Civic in recent years - which has led to this striking tenth-gen model we’re running. Both companies have followed the trend for downsizing engines though, which has brought the two cars together for battle of the turbocharged 1.0-litre three-cylinder petrol engines. 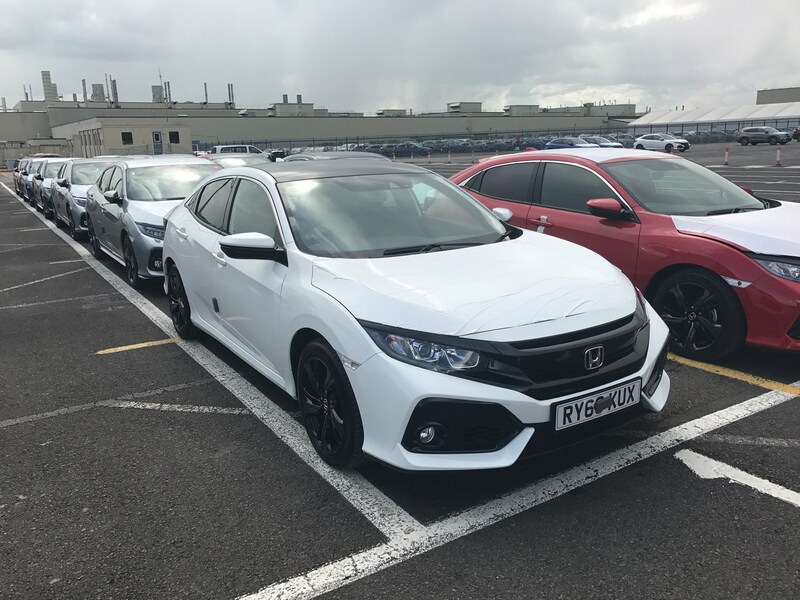 We lined our Civic up against a 1.0-litre Golf with a manual gearbox, so we’ll make comparisons between both manual and automatic versions of both cars. The key thing to note here is that we drove our CVT-equipped Civic back-to-back with a manual Golf, which you might think is unfair, but the figures show that our car is faster than its manual counterpart in a 0-62mph dash, despite its lower torque figure. 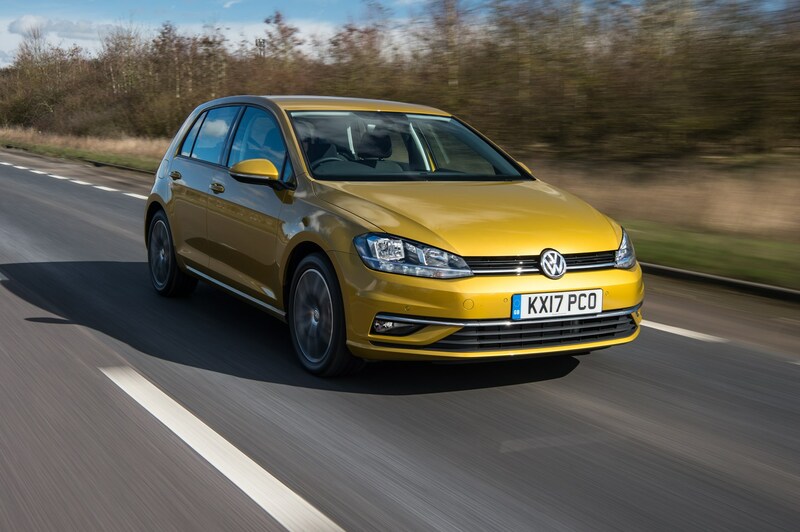 The Golf also doesn’t have varying performance figures, whether you go for manual or DSG. What were they like on the road? 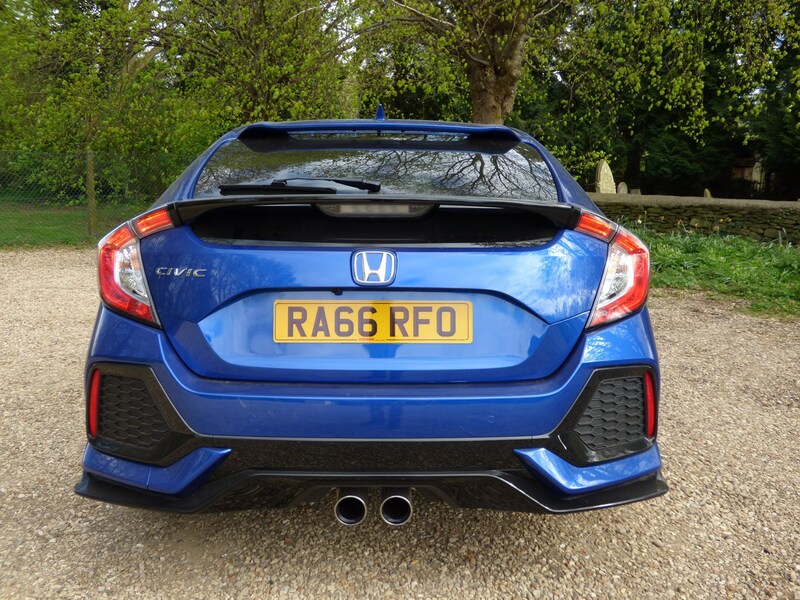 You won’t mistake the Civic for anything other than a three-cylinder due to its growly engine note that we’ve commented on previously. It adds interest and a bit of excitement to the driving experience of what’s actually quite a sensible hatchback. None quite more sensible than a Golf, though, and the 1.0-litre of the VW is very hushed when you jump in it after the Civic. The characteristic three-cylinder thrum only makes itself heard when you really push hard towards the rev limiter, and even then it’s barely intrusive. It’s a much quieter, more civilised affair. 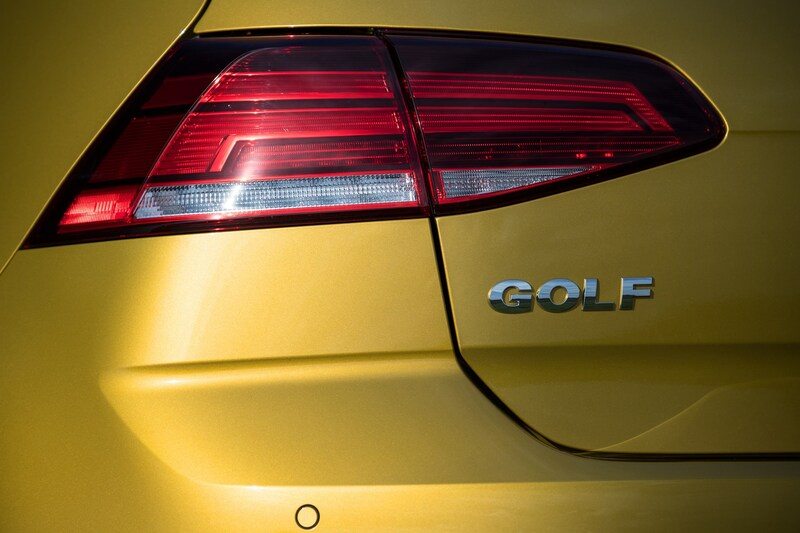 What you do notice is how much quicker the Golf feels on the road. Despite its near-20hp shortfall, it feels faster pulling out of junctions, working your way up through the gears and overtaking traffic on the motorway. It amazed us just how nippy it felt for what seemed such a small power output, to the point where we’d question why most buyers would even need a more powerful example. The Civic is the more involving car to drive, though. The balanced chassis, impressive ride quality and nicely weighted steering mean it’s more enjoyable on a twisty country road. The Golf is decent enough with well-weighted steering and a good ride, but you’re much more likely to get a smile on your face from the Honda. 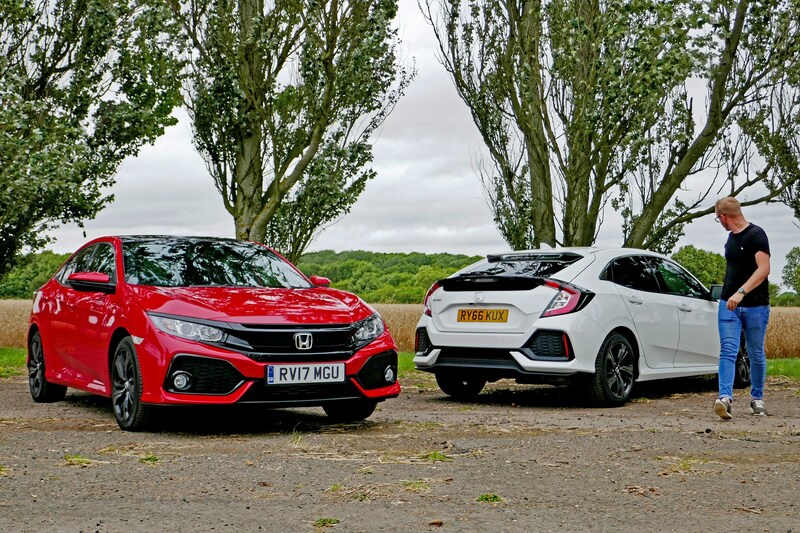 Spec-for-spec, these two cars aren’t direct competitors, as our EX-spec Civic is more in line with a Golf GT, rather than the SE Nav model we tested. However, despite our Civic’s high price, it comes packed with equipment that you’d need to pay extra for on the Golf – even top-spec examples. 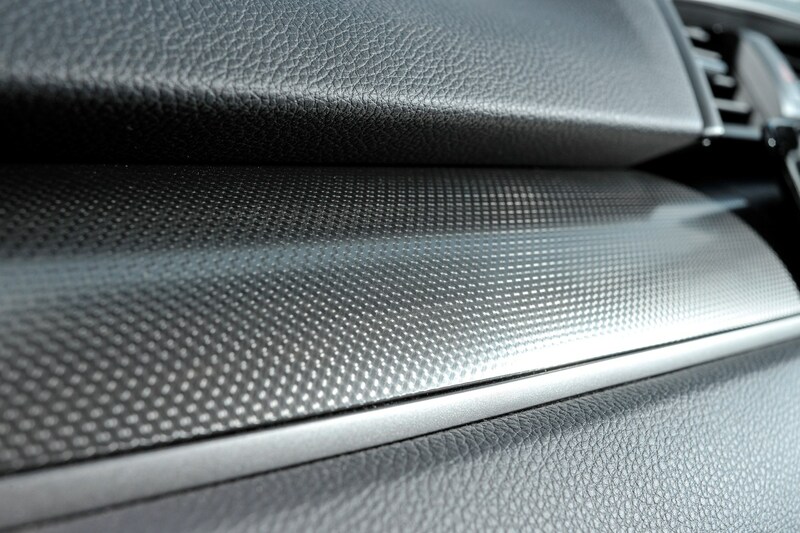 For instance, leather trim is standard on the Civic, whereas you’d need to pay whopping £1,900 for it on the Golf. A very balanced test, this. Despite the different gearboxes, some interesting differences made themselves clear. 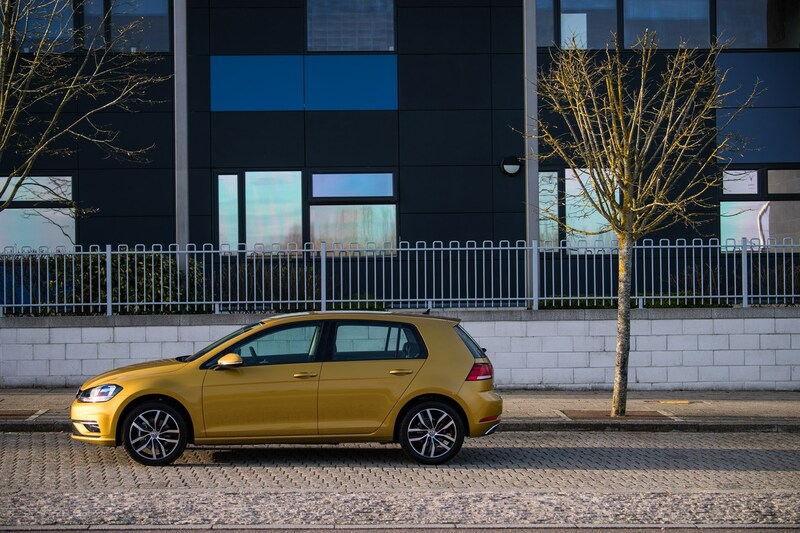 The Golf’s 1.0-litre TSI engine is something of a gem, providing more performance than you might expect, which adds to the normally safe and sensible driving experience. 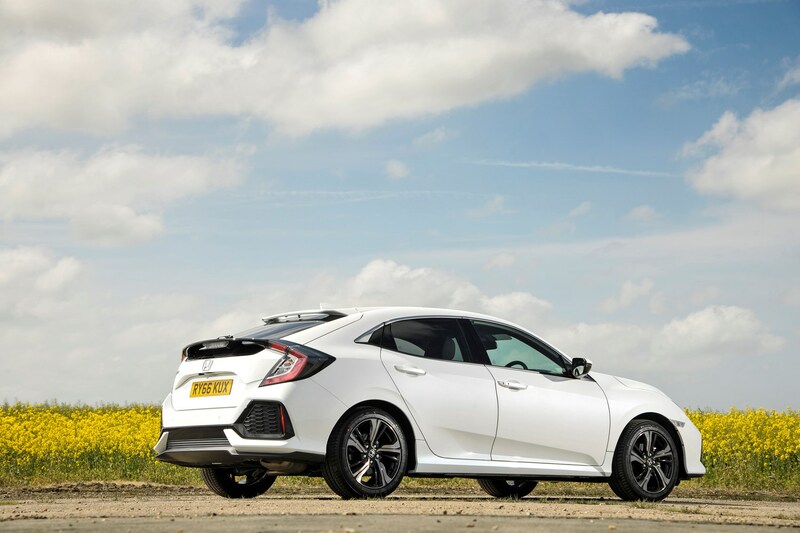 However, get to a country road and the Civic is the one you’d want to be in – and you can take manual control of the CVT gearbox to feel a little more involved as well, which goes some way to making up for the performance deficit. Third report: Do the sums add up? With the majority of new car buyers opting for some kind of finance, we wouldn’t be doing our job if we didn’t tell you how much our cars would cost customers on a monthly basis. 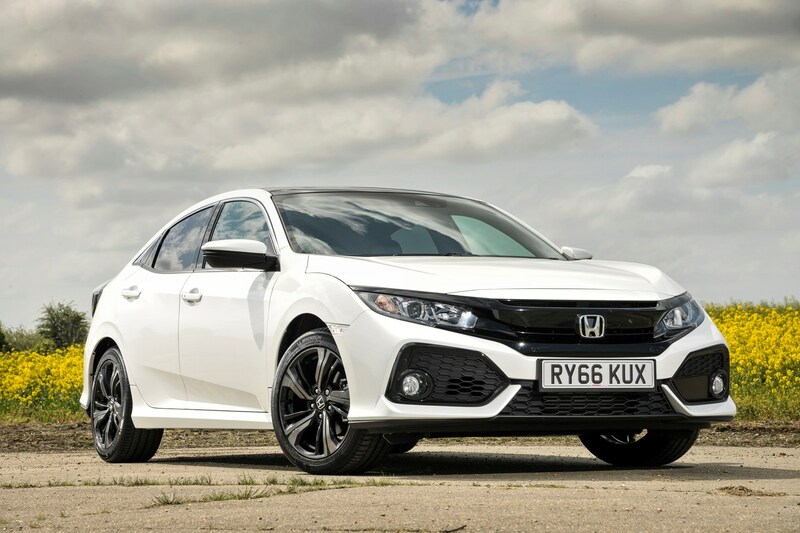 We’ve been online to check out what kind of offers Honda has running on its new Civic hatchback – we’ve also looked into some of its rivals to see if it represents good value (or not). While a £229 monthly payment seems reasonable for a car packed with equipment, the customer deposit is a sizeable one at 30% of the car’s price, and 5.9% APR is relatively high. It’s likely many buyers would prefer to put down a smaller deposit, meaning that the monthly payment could be a lot higher for you, if this is the case. 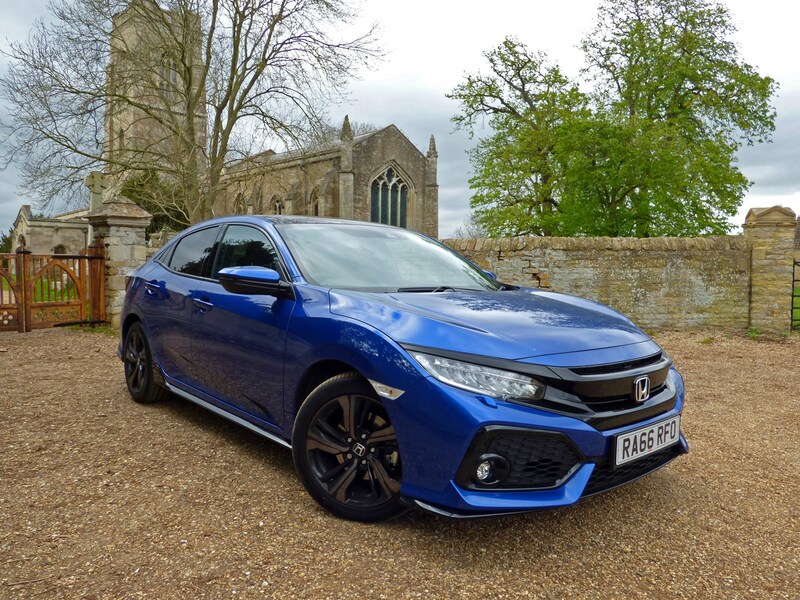 When we picked our car up, we were quoted a monthly cost of £239 per month for the CVT automatic model, assuming a similar 30% deposit up front and a £750 contribution – smaller than with many rivals’ finance offers – from Honda. And what about some alternatives? 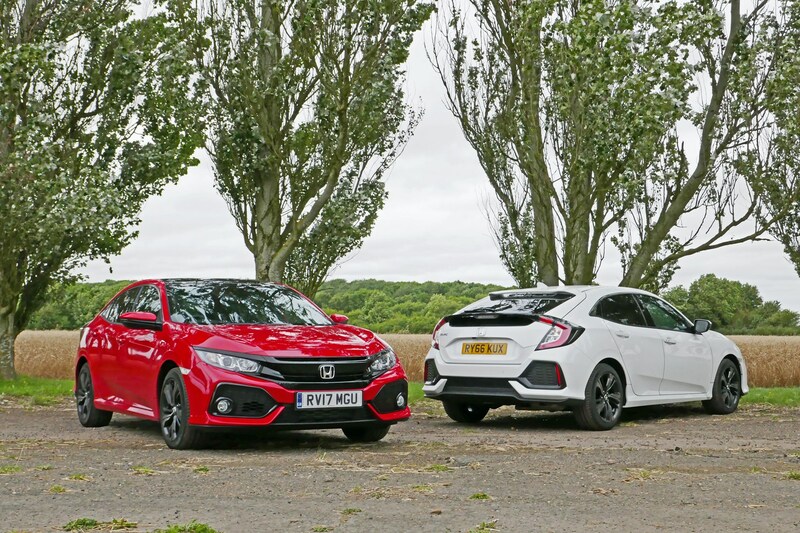 We’ve fished out some rival models to see if the Civic represents good value, using the same contract terms for fair comparison. We’ve picked out some interesting alternatives, as well as some more mainstream cars. Unlike the Civic (and almost every other small hatch), Mazda doesn’t turbocharge its engines, so you can have your 3 hatchback with a 2.0-litre naturally-aspirated engine producing 120hp. Opt for a top-spec Sport Nav and you get all kind of goodies you get on our Civic included. A quick visit to Mazda’s car configurator will allow you to calculate a finance quote. If you make the deposit the same £6,402 as the Civic, a 3 Sport Nav 2.0-litre petrol with 120hp will cost just £159 per month over 36 months. Factor in 0% APR, a lower list price and £1,500 deposit contribution from Mazda in the first place, and the 3 will cost almost £6,000 less than our Civic overall to buy outright at the end of the term, if you so desire. Fancy something with a bit more kerb appeal and an involving drive? With exactly the same deposit as the Civic, a MINI Clubman in 1.5-litre Cooper form will cost just £129 per month over 37 months. There’s a £1,500 deposit contribution from MINI, meaning that if you buy the car outright at the end of the term, you’ll be paying around £4,100 less than the Honda. And that could easily be spent on the options list (which you’ll need to do to get as much kit as the Civic offers). 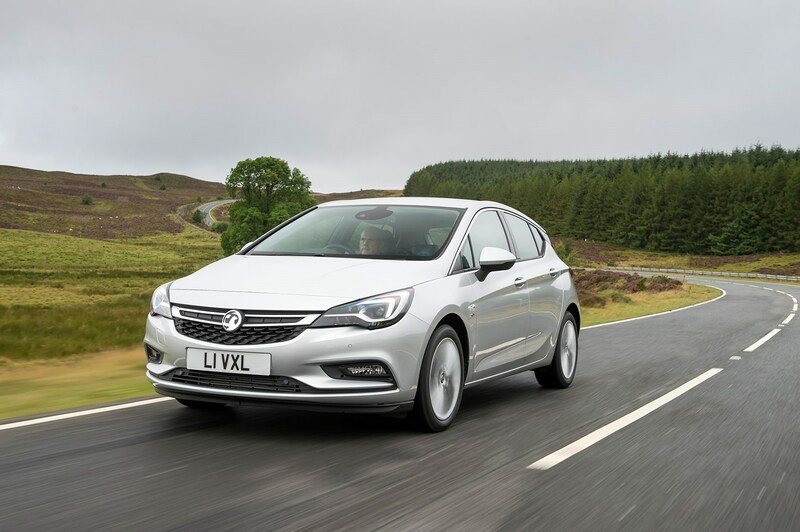 The Vauxhall Astra is more mainstream, but offers an interesting comparison when you see what you get for the money. Opt for a top-spec Elite Nav model with a punchy 150hp 1.4-litre turbo petrol under the bonnet, and with the same deposit as the Honda, it’ll be yours for £189 per month. There’s a £2,000 deposit contribution from Vauxhall as well, and if you buy the car at the end of the agreement, you’ll have saved nearly £5,000 compared with the Civic. The Civic has a huge amount of competition, and the three cars above aren’t the only ones putting the Civic’s high price into perspective. 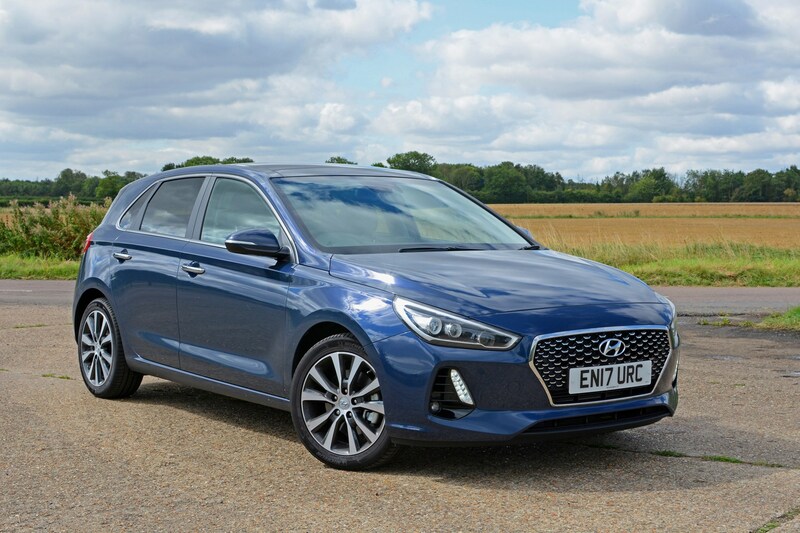 A mid-spec Hyundai i30 SE Nav 1.0-litre T-GDI will cost £195 per month with that hefty £6,400 deposit, while even a prestigious BMW 118i M Sport comes in at £193 per month. The likes of Audi and Volkswagen are more expensive, though you do get much more powerful engines and sportier styling in exchange. A VW Golf GT with the new turbocharged 1.5-litre petrol engine will set you back £249 per month (with a slightly smaller deposit), while an Audi A3 Sportback in S Line trim with the same 1.5-litre motor costs £246 per month. Meanwhile, the older Kia Cee’d costs more at £247 per month with a 1.0-litre turbo in GT-Line trim. It tells us that finance costs for cars with similar list prices can vary wildly, all based on the manufacturers' offers, interest rates and incentives. 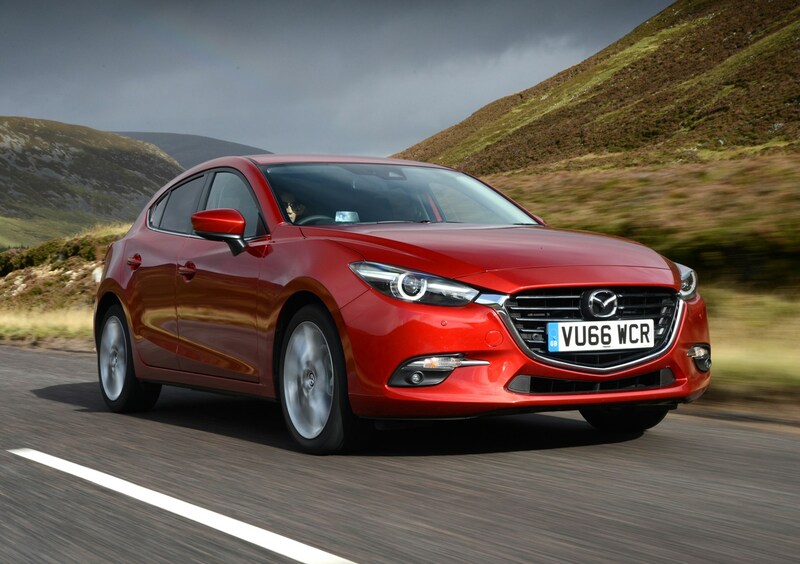 While we have a variety of engines and gearboxes here, you can’t ignore the value of something like the Mazda 3 in this comparison – and it’s down to its lower list price and 0% interest rate. 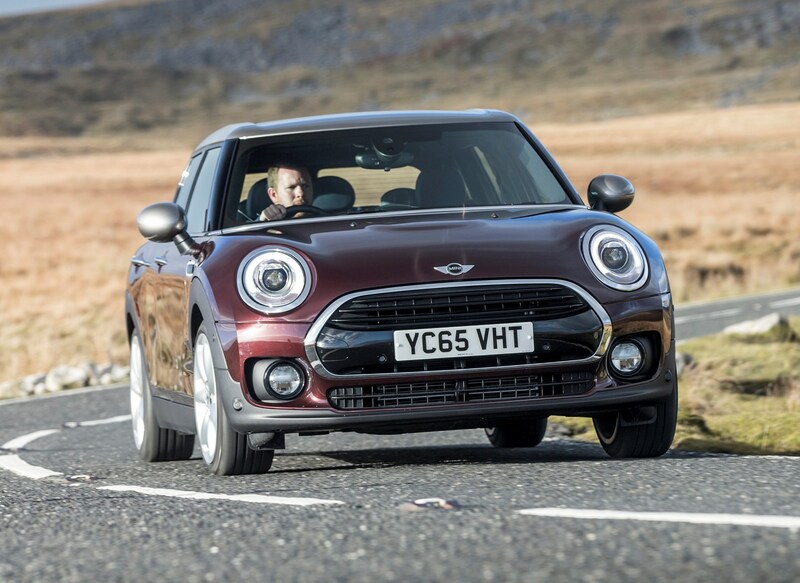 The MINI Clubman is surprisingly affordable, too, at £100 per month less than the Honda. The Civic, meanwhile, is pricey whether you want to run it for the length of the PCP finance contract and then hand it back or buy it when the contract ends. 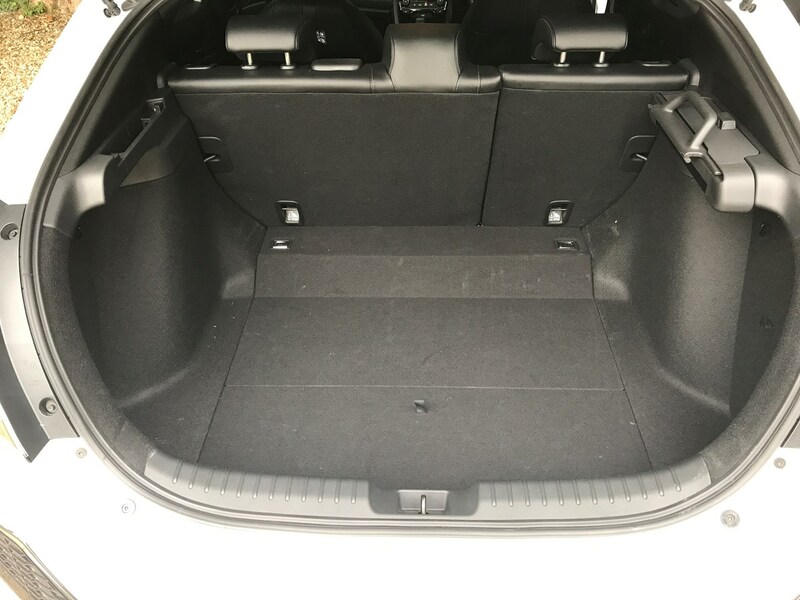 What the Civic can claw back from this comparison is that it offers a superior amount of space and standard equipment to most cars mentioned here. 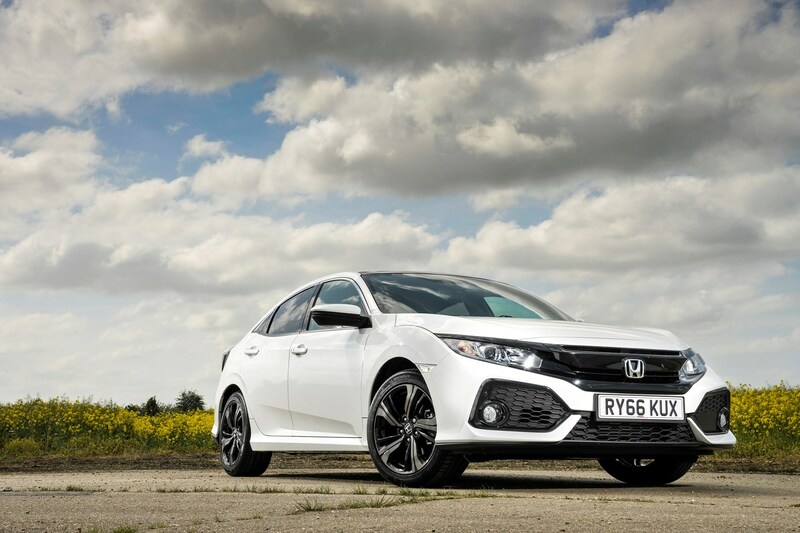 Navigating the new Honda Civic’s range is a bit of a mission, such is the choice on offer in terms of trim level. There’s SE, SR, EX, Sport, Sport Plus and Prestige. Still with me? Good. Luckily, the choice of engines is much easier to decipher. It’s petrol all the way (for now) with a choice between a 1.0-litre turbocharged three-cylinder unit and a 1.5-litre four-cylinder turbo. Both are available with a six-speed manual or CVT automatic gearbox. What do you get on a Civic EX? 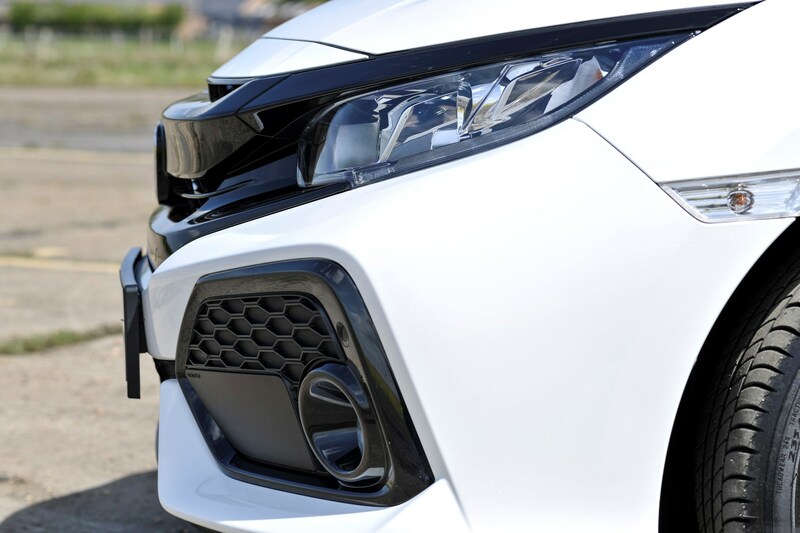 Honda Sensing safety system, including autonomous emergency braking, lane departure warning with active lane keep assist, traffic sign recognition, adaptive cruise control, blindspot monitoring and rear cross-traffic alert. Honda doesn’t really ‘do’ options the way manufacturers like Volkswagen do. If you want a higher-spec Civic, buy the next model up the range. Simple. You can specify the Tech Pack on EX-spec cars though, which adds some bright LED headlamps, wireless phone charging, headlight washers, LED fog lights and heated rear seats. It adds £600 to the list price of the car. There are some particularly garish exterior trim finishes to opt for, including an ‘Orange Line’ kit, which adds orange trim to the door mirrors, front and side skirts, wheels and dashboard. There’s also a black version of the same kit. Is EX the sweet spot in the range? It could well be. While it’s not cheap to buy, it comes packed with some desirable equipment as standard that you’d have to pay extra for on many of its rivals. It’s also all very easy to operate, especially the various safety and assistance systems. We’re finding some of them like to interfere more than others, though. The automatic braking – named Collision Mitigation Braking System – does like to make itself heard even in situations where there’s plenty of distance between you and the car in front. One particular situation it likes to do this is changing lane on the motorway, but I’m yet to experience it actually brake itself. 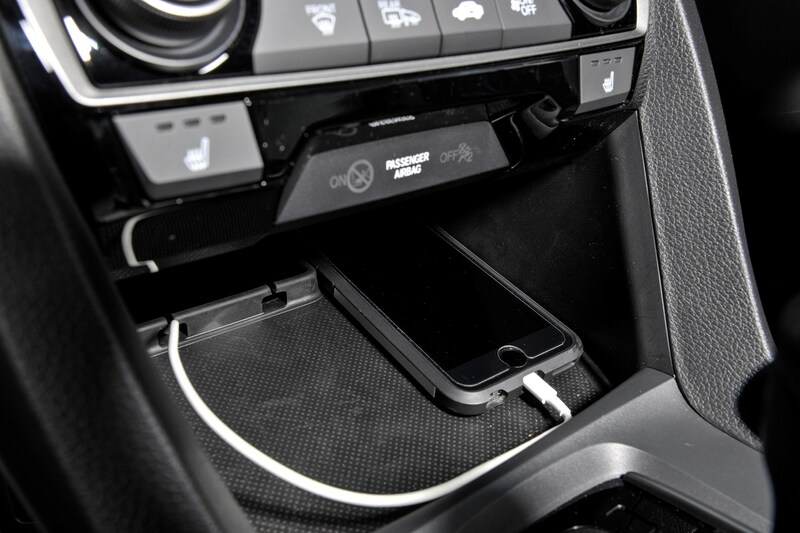 Everything else aside, the plentiful gadgets on offer are keeping us entertained and, more importantly, safe on the road. 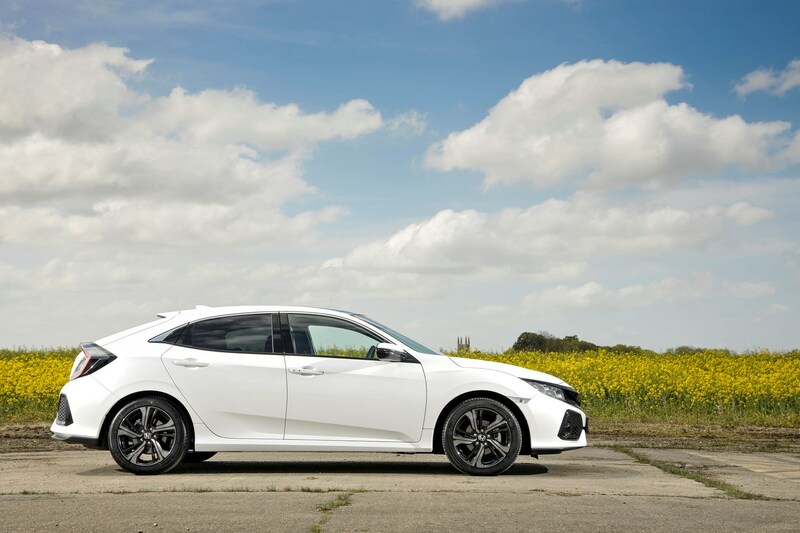 Now in its 10th generation, the Honda Civic has been around for more than 40 years in the UK. In that time, it’s evolved from a boxy little runaround to the angular, swoopy hatchback you can buy today. There was a brief run of beige somewhere in the middle, but we won’t dwell on that. In recent years, Honda has been more daring with its design in a bid to appeal to younger customers, and the latest version is the most striking of the lot. We’re running one for the next six months to see if it’s a worthy alternative to the ubiquitous Volkswagen Golf, Ford Focus, Vauxhall Astra et al, and if the striking new look means compromises have been made. After all, previous versions have been hailed for their impressive practicality. We’ll also be seeing how it compares with other family hatchbacks, and whether or not this is the engine and trim combo to go for. What spec is our Honda Civic? Under the bonnet of our mid-spec Civic EX is an all-new 1.0-litre three-cylinder turbo petrol engine producing 129hp, mated to a CVT automatic gearbox. For £25,125 (including metallic paint), the Civic isn’t a cheap car, but EX trim is one packed with desirable equipment. We’ll go into greater detail about all of its kit at a later date. Honda has gone back to basics with the interior of this Civic, ditching the multi-level, multi-angle design of the old model and, so far, I think it’s all the better for it. It’s more like a regular car with a central screen and dials ahead of the steering wheel – not raised up and split between various displays. You just get one digital readout that’s crisp and interesting. Finding a comfortable driving position is easy, but the first thing you notice is just how low-slung it is - at least there’s plenty of adjustment in all the controls. We didn’t have to go far to collect our car, either. 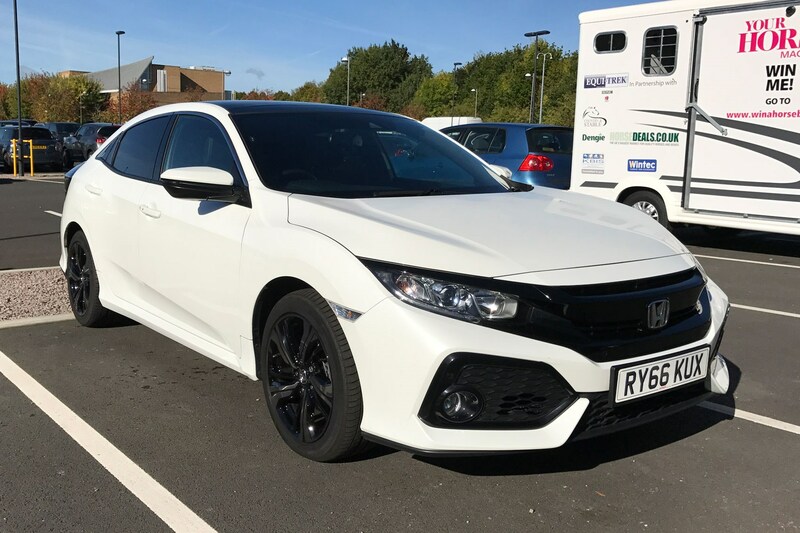 Built in sunny Swindon, this 10th-gen Civic is exported around the world and is virtually the same model you’ll find on sale in places as far-flung as the USA and Australia. We’re hoping to return for a full tour of the production line during our time with the car. So far, the Civic has had an easy introduction to life on the Parkers fleet. Its styling is dividing opinion already, but I think it looks great, and I’m enjoying the newly simplified interior and the trappings of high-spec EX trim. On the move, the Civic is good to drive with decent body control and responsive, direct steering and an excellent ride, but I’m intrigued as to how I’ll get on with that CVT gearbox over time.